본 발명은 호스트 기기(2)에 대하여 착탈 가능하게 부착되는 리무버블 메모리 카드(1)이다. The present invention is a removable memory card (1) to be removably attached to a host apparatus (2). 메모리 카드(1)는 기록되어 있는 데이터가 소정의 데이터량의 블록 단위로 일괄 소거되는 불휘발성의 반도체 메모리와, 본 장치의 내부 정보가 기록된 시스템 정보 기억부와, 호스트 기기(2)로부터 주어진 커맨드에 기초하여, 반도체 메모리에 대한 제어를 행하는 제어부를 구비한다. A memory card (1) is data which is recorded in the nonvolatile semiconductor memory chip erase in blocks of a predetermined data amount, and the internal information storage unit of the recording system information of the device, given from the host apparatus (2) based on the command, and a control unit that performs control for a semiconductor memory. 메모리 카드(1)는 초기화용의 커맨드를 받아들일 수 있다. Memory card (1) it can accept commands for initialization. 메모리 카드(1)는 호스트 기기(2)로부터 초기화 커맨드가 주어지면, 시스템 정보 기억부에 저장되어 있는 파라미터에 따라, 반도체 메모리 상의 기록 영역을 논리 포맷한다. A memory card (1) is given an initialization command from the host apparatus (2), according to the parameter stored in the system information storage section, a logical format of the recording area on the semiconductor memory. 본 발명은 내부에 불휘발성의 반도체 메모리를 구비한 데이터 기억 장치에 관한 것이다. The present invention relates to a data storage device having a nonvolatile semiconductor memory therein. 본 출원은 일본에서 2002년 4월 15일에 출원된 일본 특허 출원 번호2002-112635를 기초로 우선권을 주장하는 것으로서, 이 출원은 참조로서, 본 출원에 원용된다. The present application as that based on Japanese Patent Application No. 2002-112635, filed on April 15, 2002 in Japan, claims the priority, the application as a reference, is incorporated in the present application. 종래, NAND형 플래시 메모리를 이용한 데이터 기억 장치로서, 소위 메모리 카드라 불리는 IC 메모리 장치가 이용되고 있다. Conventionally, as a data storage device using a NAND-type flash memory, an IC memory device known as a so-called memory card it is used. 이 IC 메모리 장치는 기록 재생 장치에 대하여 착탈 가능하게 이용된다. The IC memory device is used removably to the recording and reproducing apparatus. 이러한 종류의 메모리 카드는 정지 화상 데이터, 동화상 데이터, 음성 데이터, 음악 데이터 등의 각종 디지털 데이터를 저장할 수 있다. This type of memory card may store various digital data such as still picture data, moving picture data, audio data, music data. 그 때문에, 메모리 카드는, 예를 들면 정보 휴대 단말기, 데스크탑형 컴퓨터, 노트형 컴퓨터, 휴대 전화기, 오디오 장치, 가전 장치 등의 호스트 기기의 외부 기억 미디어로서 이용된다. For this reason, a memory card, for example, information is used as a portable terminal, the external storage medium of host device such as a desktop type computer, a notebook computer, a cellular phone, audio apparatus, home devices. 메모리 카드를 외부 기억 미디어로서 이용하는 호스트 기기는, 하드디스크 등의 내부 기억 미디어가 구비되는 경우가 있다. A host device using a memory card as an external storage media, there is a case that includes an internal storage medium such as a hard disk. 하드디스크는, 일반적으로 MS-DOS(상표)라고 불리는 파일 시스템을 매개로 하여 호스트 기기로부터 논리 포맷으 로 액세스가 이루어진다. Hard disk is generally made of an MS-DOS (R) to the file system, the medium access from the host device to the logical format coming called. 따라서, 메모리 카드도, 이러한 다른 기억 미디어와의 호환성을 도모하기 위해서, MS-DOS 등의 일반적인 파일 시스템을 적용할 수 있는 것이 바람직하다. Therefore, it is desirable that the memory cards, in order to promote compatibility with other such storage medium, can be applied to the common file system, such as MS-DOS. MS-DOS에서는 스토리지 미디어의 사용자 영역에, 파일의 관리 데이터로서, MBR(Master Boot Record), PBR(Partion Boot Record), FAT(Fail Allocation Table), 루트 디렉토리 엔트리를 기록하는 등의 처리를 행함으로써, 초기화가 행해진다. In MS-DOS, by performing a process, such as in the user area of ​​the storage media, the record, MBR (Master Boot Record), PBR (Partion Boot Record), FAT (Fail Allocation Table), a root directory entry as the management data of the file , the initialization is performed. 이러한 파일 관리 데이터를 기록하여 초기화함으로써, 호스트 기기측의 오퍼레이션 시스템으로부터 액세스가 가능하게 된다. By initialization by recording this file management data, with the result that access is possible from the operation system of the host device side. 따라서, 메모리 카드도, 호스트 기기가 상술한 파일 관리 데이터를 플래시 메모리에 기입함으로써, 초기화가 행해진다. Thus, the memory card also, by writing the file data managed by the host device to the above-described flash memory, the initialization is performed. 그런데, 동일 규격의 메모리 카드라도, 플래시 메모리의 용량이 다른 경우가 있다. By the way, even the memory card having the same size, the capacity of the flash memory may be different. 데이터의 기록 재생 장치로서 기능하는 호스트 기기는, 용량이 다른 메모리 카드를 외부 미디어로서 초기화하는 경우, 각 용량마다 대응하는 MBR 등의 내용을 나타내는 초기화용의 파라미터나 초기화 제어 처리 프로그램을 각각 구비할 필요가 있다. Host apparatus functioning as a recording and reproducing device of the data is, when the capacity is initialized, the other memory card as an external media, the need to provide the parameter or initialization control process program for initialization to indicate the content of the MBR or the like corresponding to each capacitor respectively, a. 이와 같이 호스트 기기측에서 초기화용의 파라미터를 구비하고 있었다고 해도, 예를 들면 새로운 용량의 메모리 카드가 제공된 경우에는 대응할 수 없다. Thus, even if there if provided with a parameter of the initialization by the host device side, for example, provided with a current capacity of the memory card can not cope. 본 발명의 목적은, 종래의 IC 메모리 장치 등의 데이터 기억 장치가 갖는 문제점을 해소할 수 있는 신규 데이터 기억 장치를 제공하는 것에 있다. An object of the present invention is to provide a novel data storage apparatus that can solve the problem with the data storage device such as the conventional IC memory device. 본 발명의 다른 목적은, 호스트 기기가 초기화용의 제어 프로그램이나 파라미터를 구비하지 않고 용이하게 초기화를 행할 수 있는 데이터 기억 장치를 제공하는 것에 있다. Another object of the present invention is to provide a data storage device with a host device to perform the initialization easily without having a control program and parameters of the initialization. 상술한 목적을 달성하기 위해서 제안되는 본 발명에 따른 데이터 기억 장치는, 호스트 기기에 대하여 착탈 가능하게 부착되는 리무버블 데이터 기억 장치로서, 기록되어 있는 데이터가 소정의 데이터량의 블록 단위로 일괄 소거되는 불휘발성의 반도체 메모리와, 본 장치의 내부 정보가 기록된 시스템 정보 기억부와, 호스트 기기와의 사이에 데이터의 입출력을 행하는 인터페이스와, 호스트 기기로부터 인터페이스를 통하여 주어진 커맨드에 기초하여, 반도체 메모리에 대한 제어를 행하는 제어부를 구비한다. Data storage apparatus according to the present invention is proposed in order to achieve the above object, as a removable data storage device that is detachably attached to a host apparatus, data that has been recorded is to be collectively erased in units of blocks of a predetermined data amount to and with a non-volatile semiconductor memory, for performing input and output of data between the and the internal information storage unit of the recording system information of the device, the host device interface, through the interface from the host apparatus based on the given command, the semiconductor memory and a control section for performing control. 반도체 메모리에는 사용자에 의해 데이터가 기록되는 영역인 사용자 영역이 형성되고, 사용자 영역에는 블록의 사이즈의 1/n배(n은 2 이상의 정수)의 사이즈인 클러스터 단위로 파일의 관리를 행하는 논리 포맷에 대응한 파일 관리 데이터가 기록되고, 이 논리 포맷에 기초하여 호스트 기기로부터 액세스가 이루어져, 시스템 정보 기억부에는 파일 관리 데이터를 사용자 영역 상에 기록하기 위한 파라미터를 저장한다. A logical format for performing the management of the file to the size of the cluster unit of the semiconductor memory, the area in which data is written by the user, the user area is formed, and the user area is 1 / n times the size of a block (n is an integer of 2 or greater) a corresponding file management data is recorded, on the basis of the logical format is made accessible from the host apparatus, the system information storage unit stores the parameters for recording file management data for the user area. 제어부는 호스트 기기로부터 초기화 커맨드가 주어지면, 시스템 정보 기억부에 저장되어 있는 파라미터에 따른 파일 관리 데이터를 반도체 메모리에 기록하도록 제어한다. The control given the initialization command from the host apparatus, and controls to record file management data corresponding to the parameter stored in the system information storage unit to the semiconductor memory. 본 발명의 또다른 목적, 본 발명에 의해 얻어지는 구체적인 이점은, 이하에 있어서 도면을 참조하여 설명되는 실시 형태의 설명으로부터 한층 명확해질 것이다. Further objects, features and advantages according to the invention of the present invention will become more apparent from the following description of embodiments to be described with reference to the drawings in the following. 도 1은 본 발명이 적용된 메모리 카드 및 이 메모리 카드를 이용하는 호스트 기기를 도시하는 사시도. Figure 1 is a perspective view showing a host device using a memory card to which the invention is applied and the memory card. 도 2는 메모리 카드를 표면측에서 본 사시도. Figure 2 is a perspective view of the memory card from the front surface side. 도 3은 메모리 카드를 이면측에서 본 사시도. Figure 3 is a perspective view of the memory card from the back side. 도 4는 메모리 카드의 내부 블록 구성을 나타내는 블록도. Figure 4 is a block diagram showing the internal block structure of the memory card. 도 5는 메모리 카드와 호스트 기기와의 사이의 데이터 전송을 하기 위한 인터페이스 기능의 구성도. 5 is a configuration of the interface functions for the transmission of data between the memory card and host apparatus FIG. 도 6은 속성 정보 에리어에 기록되는 데이터 구조를 나타내는 도면. Figure 6 is a view showing a data structure recorded in the attribute information area. 도 7은 호스트 기기의 데이터 기록 처리 내용을 설명하는 흐름도. 7 is a flow diagram illustrating a data record process information of the host device. 도 8은 제1 구체예의 포맷을 적용한 경우의 미디어 이미지를 나타내는 도면. 8 is a view showing an image of a media case of applying the first embodiment format. 도 9는 제1 구체예의 포맷을 적용한 경우의 각 파라미터의 값을 나타내는 도면. 9 is a diagram showing the values ​​of each parameter in the case of applying the first embodiment format. 도 10은 제1 구체예의 포맷을 적용한 경우의 MBR의 기술 내용을 나타내는 도면. Figure 10 is a view of the MBR of the technical details of the case of applying the first embodiment format. 도 11은 제1 구체예의 포맷을 적용한 경우의 PBR의 기술 내용을 나타내는 도면. Figure 11 is a view of the technical details of the PBR in the case of applying the first embodiment format. 도 12는 제2 구체예의 포맷을 적용한 경우의 미디어 이미지를 나타내는 도면. Figure 12 is a view showing an image of a media case of applying the second embodiment format. 도 13은 제2 구체예의 포맷을 적용한 경우의 각 파라미터의 값을 나타내는 도면. 13 is a diagram showing the values ​​of each parameter in the case of applying the second embodiment format. 도 14는 제2 구체예의 포맷을 적용한 경우의 MBR의 기술 내용을 나타내는 도면. 14 is a view showing the MBR of the technical details of the case of applying the second embodiment format. 도 15는 제2 구체예의 포맷을 적용한 경우의 PBR의 기술 내용을 나타내는 도면. 15 is a view showing the PBR of the technical details of the case of applying the second embodiment format. 도 16은 제1 구체예의 포맷을 적용한 경우의 FAT의 상태를 나타내는 도면. 16 is a view showing a state of the FAT in the case of applying the first embodiment format. 도 17은 제2 구체예의 포맷을 적용한 경우의 FAT의 상태를 나타내는 도면. 17 is a view showing a state of the FAT in the case of applying the second embodiment format. 도 18은 통상 포맷의 미디어 이미지를 나타내는 도면. 18 is a view showing an image of the normal media format. 도 19는 블록 사이즈가 클러스터 사이즈보다 작은 메모리 카드의 미디어 이미지를 나타내는 도면. 19 is a view a block size that represents the media image of a small memory card than cluster size. 도 20은 블록 사이즈와 클러스터 사이즈가 동일한 메모리 카드의 미디어 이미지를 나타내는 도면. 20 is a view a block size and a cluster size that represents the media image of the same memory card. 이하, 본 발명을 리무버블 소형 IC 메모리 장치, 및 이 소형 IC 메모리 장치를 외부 기억 미디어로서 이용하는 데이터 처리 장치에 적용한 예를 들어 설명한다. Hereinafter, the removable small IC memory device, and the small IC memory device of the present invention will be described as an example of the application of the data processing apparatus used as an external storage medium. 또, 이하의 설명에서, 소형 IC 메모리 장치를 메모리 카드라고 하고, 이 메모리 카드가 접속되는 데이터 처리 장치를 호스트 기기라고 한다. Further, it called in the following description, the small IC memory device as a memory card and the memory card is a data processing apparatus to the host apparatus is connected. 우선, 본 발명을 적용한 호스트 기기 및 이 호스트 기기에 접속되는 메모리 카드의 개략을 도 1을 참조하여 설명한다. First, it will be described by an outline of a memory card connected to a host device and a host device to which the present invention is applied with reference to FIG. 본 발명에 따른 메모리 카드(1)는, 내부에 불휘발성의 반도체 메모리(IC 메모리)를 갖고 있으며, 정지 화상 데이터, 동화상 데이터, 음성 데이터, 음악 데이터 등의 각종 디지털 데이터를 저장할 수 있다. Memory card according to the present invention (1), and having a semiconductor memory (IC memory) in the non-volatile therein and can store various digital data such as still picture data, moving picture data, audio data, music data. 이 메모리 카드(1)는, 예를 들면 정보 휴대 단말기, 데스크탑형 컴퓨터, 노트형 컴퓨터, 휴대 전화기, 오디오 장치, 가전 장치 등등의 호스트 기기(2)의 외부 기억 미디어로서 기능한다. The memory card 1 is, for example, information, and functions as the external storage medium of the portable terminal, a desktop-type computer, a notebook computer, a mobile telephone, the host apparatus (2) for an audio device, consumer electronic devices and so on. 메모리 카드(1)는, 도 1에 도시한 바와 같이 호스트 기기(2)에 형성되어 있는 삽탈구(3)에 삽입된 상태로 사용된다. Memory card 1 is also used in a state of being inserted into the host apparatus 2 shovel dislocation (3) which is formed on as shown in Fig. 메모리 카드(1)의 삽탈구(3)에 대한 삽입 및 뽑기는 사용자가 자유롭게 행할 수 있다. Insertion and drawing of the shovel dislocation (3) of the memory card 1, the user can freely be performed. 그 때문에, 임의의 호스트 기기에 삽입되어 있던 메모리 카드(1)를 뽑아내어, 다른 호스트 기기에 삽입할 수도 있다. Therefore, the pull out the memory card 1 that has been inserted in any of the host device, it may be inserted into another host device. 즉, 본 메모리 카드(1)는 다른 호스트 기기 사이의 데이터의 교환에 이용할 수 있다. That is, the memory card 1 can be used for the exchange of data between different host devices. 메모리 카드(1) 및 호스트 기기(2)는, 4비트 병렬 데이터, 클럭 신호, 버스 스테이트 신호의 6개의 신호를 전송하는 6선식 반이중 병렬 프로토콜을 이용한 병렬 인터페이스로 데이터의 전송을 행한다. Memory card 1 and host apparatus 2 is in 4-bit parallel data, clock signal, a parallel interface using a six-wire half-duplex parallel protocol for transferring six signals on the bus-state signal is carried out the transmission of data. 본 발명에 따른 메모리 카드(1)는, 도 2에 도시한 바와 같이 대략 장방형의 얇은 판자 형상으로 형성되고, 길이 방향의 길이 L 1 을 50㎜로 하고, 폭 W 1 을 21.45㎜로 하고, 두께 D 1 을 2.8㎜로 하여 형성되어 있다. Memory card 1 according to the invention, also it is formed in a substantially rectangular thin plate shape as shown in Fig. 2, the length L 1 to a length of 50㎜ direction, and a width W 1 in 21.45㎜, thickness It is formed by a D 1 to 2.8㎜. 메모리 카드(1)는 한쪽의 면을 표면(1a)으로 하고, 다른 쪽의 면을 이면(1b)으로 하고 있다. A memory card (1) is the surface of one side surface (1a), and has a surface on the other side to the back (1b). 메모리 카드(1) 길이 방향의 일단측의 이면(1b)측에는, 도 3에 도시한 바와 같이 10개의 평면 전극인 접속 단자군(4)이 형성되어 있다. Side of the memory card 1 is on one end side of the (1b) in the longitudinal direction, and the plane electrode 10 of the connection terminal (4) is formed as shown in Fig. 접속 단자군(4)을 구성하는 각 전극은, 메모리 카드(1)의 폭 방향으로 병렬하여 형성되어 있다. Each of the electrodes constituting the connection terminal unit 4 are formed in parallel in the width direction of the memory card (1). 전극과 전극과의 각 사이에는 이면(1b)으로부터 수직으로 직립한 칸막이편(5)이 설치되어 있다. Are provided partitioning piece 5 is a vertical upright from the back surface (1b) between each of the electrodes and the electrode. 각 칸막이편(5)은 각 전극에 접속되는 접속 단자가 다른 전극에 접촉하는 것을 방지하도록 한 것이다. Each partition piece 5 is a so as to prevent the connection terminals connected to the electrodes in contact with the other electrode. 메모리 카드(1)의 이면(1b)의 일단부측의 중앙부에는, 도 3에 도시한 바와 같이 오소거 금지용의 슬라이드 스위치(6)가 설치되어 있다. Once the center portion of the side of the back surface (1b) of the memory card (1), there is a slide switch 6 for the erasure prohibition is installed as shown in Fig. 상술한 메모리 카드(1)가 장착되는 호스트 기기(2)에는, 메모리 카드(1)를 삽탈하기 위한 삽탈구(3)가 형성되어 있다. In the host apparatus (2) which is mounted above the memory card 1, a shovel dislocation 3 for saptal the memory card 1 is formed. 삽탈구(3)는, 도 1에 도시한 바와 같이 호스트 기기(2)의 전면측에 메모리 카드(1)의 폭 W 1 및 두께 D 1 에 대응하는 개구로서 형성되어 있다. Shovel dislocation (3) is formed as an opening corresponding to the width W 1 and a thickness D 1 of the memory card (1) on the front side of the host apparatus 2 as shown in Fig. 삽탈구(3)를 통하여 호스트 기기(2)에 삽입된 메모리 카드(1)는, 접속 단자군(4)을 구성하는 각 전극에 호스트 기기(2)측의 접속 단자가 접속됨으로써, 호스트 기기(2)에의 보유가 도모되어 탈락이 방지된다. Whereby the memory card 1 is inserted into the host apparatus 2 through the insertion dislocation 3, the connection terminal 4, the connection terminals on the side of the host apparatus (2) to the respective electrodes connected to configure the host device ( 2) from falling off is prevented by the holding is achieved. 또, 호스트 기기(2)측의 접속 단자는, 장착되는 메모리 카드(1)에 형성되는 접속 단자군(4)을 구성하는 전극에 대응하여 10개의 접점을 갖는다. In addition, the connection terminals of the host device 2 side, in response to constituting the connection terminal unit 4 that is formed in the memory card 1 is mounted has an electrode 10 contacts. 본 발명에 따른 메모리 카드(1)는, 접속 단자군(4)이 형성된 일단측을 삽입단으로 하고, 도 2의 화살표 X 1 방향을 삽입 방향으로 하여 삽탈구(3)를 통하여 호스트 기기(2)에 장착된다. Memory card 1 according to the present invention, the connection terminal (4) is formed one end side in the insertion stage, and the host device via the shovel dislocation 3 by the arrow X 1 direction in Fig. 2 in the insertion direction (2 ) it is mounted on. 호스트 기기(2)에 장착된 메모리 카드(1)는, 접속 단자군(4)을 구성하는 각 전극과 호스트 기기(2)측의 접속 단자의 각 접점이 접속되어, 신호의 송수신이 가능한 상태가 된다. The memory card 1 is attached to the host apparatus (2), is that each respective contact of the connection terminals of the electrodes and the host apparatus 2 side constituting the connection terminal 4 is connected, a state in which transmission and reception of signals possible do. 다음으로, 본 발명에 따른 메모리 카드(1)의 내부 구성을 도 4를 참조하여 설명한다. Next, it will be described with reference to Figure 4, the internal structure of the memory card 1 according to the invention. 본 발명에 따른 메모리 카드(1)는, 도 4에 도시한 바와 같이 병렬 인터페이스 회로(I/F)(12)와, 레지스터 회로(13)와, 데이터 버퍼 회로(14)와, ECC 회로(15)와, 메모리 I/F 컨트롤러(16)와, 불휘발성 반도체 메모리(17)와, 발진 제어 회로(18)를 구비하고 있다. And a memory card (1) has a parallel interface, as shown in Fig. 4 circuit (I / F) (12), and a register circuit 13, a data buffer circuit 14 according to the present invention, ECC circuit (15 ), and it is provided with a memory I / F controller 16, and a non-volatile semiconductor memory 17, and a starting control circuit (18). 병렬 I/F 회로(12)는 6선식 반이중 병렬 방식의 데이터 전송 프로토콜을 이용하여, 호스트 기기(2)와의 사이에서 데이터의 전송을 행하는 회로이다. Parallel I / F circuit 12 by using the six-wire half-duplex parallel protocol for data transmission, the circuit for the transmission of data and from the host apparatus 2. 레지스터 회로(13)는, 예를 들면 호스트 기기로부터 전송되는 메모리 I/F 컨트롤러(16)에 대한 동작 제어 커맨드(이하, 이 동작 제어 커맨드를 컨트롤 커맨드라고 함), 메모리 카드(1) 내의 내부 상태, 컨트롤 커맨드를 실행할 때에 필요한 제반의 파라미터, 불휘발성 반도체 메모리(17) 내의 파일 관리 정보 등을 기억하는 회로이다. Internal state in the register circuit 13 is, for example, operation for the memory I / F controller 16 transferred from the host device control command (hereinafter referred to as a control command the motion control command), the memory card 1 a circuit for storing a file including management information in the various parameters, the non-volatile semiconductor memory 17, when necessary to execute the control command. 이 레지스터 회로(13)는, 호스트 기기(2) 및 메모리 I/F 컨트롤러(16)의 양자로부터 액세스된다. The register circuit 13 is accessed from both the host device 2 and the memory I / F controller 16. 또, 호스트 기기(2)는, 본 메모리 카드의 데이터 전송 프로토콜 상에서 규정되는 전송 프로토콜 커맨드(이하, TPC(Transfer Protocol Command)라고 함)를 이용하여, 레지스터 회로(13)에 대하여 액세스를 행한다. In addition, the host device 2, using a transfer protocol command (hereinafter referred to as a Transfer Protocol Command (TPC)) which is defined on a data transmission protocol of the memory card, it executes the access with respect to the register circuit 13. 즉, 레지스터 회로(13)에 저장되는 컨트롤 커맨드나 각종 파라미터에 대하여 호스트 기기(2)가 기입이나 판독을 하는 경우에는 TPC를 이용하여 행한다. That is, when the host device 2 with respect to the control command and various parameters written or read is stored in the register circuit 13 is carried out by using a TPC. 데이터 버퍼 회로(14)는, 불휘발성 반도체 메모리(17)에 기입되는 데이터, 및 불휘발성 반도체 메모리(17)로부터 판독된 데이터를, 일시적으로 보존하는 메모 리 회로이다. A data buffer circuit 14, the data read from the data, and the non-volatile semiconductor memory 17 to be written in the non-volatile semiconductor memory 17, a memory circuit for temporarily stored. 즉, 호스트 기기(2)로부터 불휘발성 반도체 메모리(17)에 데이터가 기입되는 경우에는, 기입 대상 데이터가 호스트 기기(2)로부터 데이터 버퍼 회로(14)에 데이터 전송 프로토콜에 따라 전송되고, 그 후 데이터 버퍼 회로(14)에 저장되어 있는 기입 대상 데이터를 메모리 I/F 컨트롤러(16)가 불휘발성 반도체 메모리(17)에 기입한다. That is, when writing the data in the non-volatile semiconductor memory 17 from the host apparatus (2), the write target data is transferred according to the data transmission protocol in the data buffer circuit 14 from the host apparatus 2, and then and writes the write-target data stored in the data buffer circuit 14 to the memory I / F controller 16, a nonvolatile semiconductor memory (17). 불휘발성 반도체 메모리(17)로부터 호스트 기기(2)에 데이터가 판독되는 경우에는, 메모리 I/F 컨트롤러(16)가 불휘발성 반도체 메모리(17)로부터 판독 대상 데이터를 판독하여 일단 데이터 버퍼 회로(14)에 저장하고, 그 후 그 판독 대상 데이터가 데이터 전송 프로토콜에 따라 데이터 버퍼 회로(14)로부터 호스트 기기(2)에 전송된다. In the case that data to the host apparatus (2) from the non-volatile semiconductor memory 17 is read out, the memory I / F controller 16. The nonvolatile one reads the read target data from the semiconductor memory 17, a data buffer circuit (14 ) stored in, and then is transferred to the data buffer circuit (host apparatus 2 from 14) in accordance with the read target data to the data transfer protocol. 또, 데이터 버퍼 회로(14)는 소정의 데이터 기입 단위(예를 들면, 플래시 메모리의 페이지 사이즈와 동일한 512바이트)분의 데이터 용량을 갖고 있다. In addition, the data buffer circuit 14 has a data capacity for a predetermined data writing unit (for example, the same 512 bytes of the page size of the flash memory) minutes. 또, 호스트 기기(2)는 TPC를 이용하여, 데이터 버퍼 회로(14)에 대하여 액세스를 행한다. In addition, the host device 2 using a TPC, performs the access to the data buffer circuit 14. 즉, 데이터 버퍼 회로(14)에 저장되는 데이터에 대하여, 호스트 기기(2)가 기입이나 판독을 하는 경우에는 TPC를 이용하여 행한다. In other words, all data stored in the data buffer circuit 14, if the host apparatus 2 that the writing or reading is performed using the TPC. ECC 회로(15)는 불휘발성 반도체 메모리(17)에 기입되는 데이터에 대하여 오류 정정 코드(ECC)를 부가한다. ECC circuit 15 adds an error correction code (ECC) to the data to be written in the non-volatile semiconductor memory 17. 또한, ECC 회로(15)는 불휘발성 반도체 메모리(17)로부터 판독한 데이터에 부가되어 있는 오류 정정 코드에 기초하여, 이 판독된 데이터에 대한 오류 정정 처리를 행한다. Also, ECC circuit 15 on the basis of the error correction code that is added to the data read from the non-volatile semiconductor memory 17, performs error correction processing for the read data. 예를 들면, 오류 정정 코드는 512바이트의 데이터 단위에 대하여 3바이트분 부가된다. For example, an error correction code with respect to a 512-byte unit of data is added to 3 bytes. 메모리 I/F 컨트롤러(16)는 레지스터 회로(13) 내에 저장되어 있는 컨트롤 커맨드에 따라, 데이터 버퍼 회로(14)와 불휘발성 반도체 메모리(17)와의 사이의 데이터의 교환의 제어, 불휘발성 반도체 메모리(17)의 데이터의 시큐러티 관리의 제어, 메모리 카드(1)의 그 밖의 기능의 제어, 및 레지스터 회로(13) 내에 저장되어 있는 데이터의 갱신 처리 등을 행한다. A memory I / F controller 16 in accordance with the control command stored in the register circuit 13, a data buffer circuit 14 and nonvolatile control of the data exchange between the semiconductor memory 17, the nonvolatile semiconductor memory 17 the control of the security management of the data, is carried out such as a memory card (1) that the control of other functions, and the updating processing of the data stored in the register circuit 13 of the. 불휘발성 반도체 메모리(17)는, 예를 들면 NAND형 플래시 메모리 등의 불휘발성의 반도체 메모리이다. The nonvolatile semiconductor memory 17 is, for example, a nonvolatile memory such as a NAND-type flash memory chip. 불휘발성 반도체 메모리(17)의 용량은, 예를 들면 16M바이트, 32M바이트, 64M바이트, 128M바이트이다. The capacity of the nonvolatile semiconductor memory 17 is, for example, a 16M bytes, 32M bytes, 64M bytes, 128M bytes. 불휘발성 반도체 메모리(17)는, 소거 블록 단위가 예를 들면 16K바이트이다. The nonvolatile semiconductor memory 17, is an erase block unit, for example 16K bytes. 기입 및 판독 단위는 페이지라고 하며, 데이터 버퍼 회로(14)와 동일한 512바이트이다. Write and read unit, it called a page, the same 512 bytes and the data buffer circuit 14. 발진 제어 회로(18)는 본 메모리 카드(1) 내의 동작 클럭을 발생한다. Oscillation control circuit 18 generates an operation clock in this memory card 1. 메모리 카드(1)의 접속 단자에는 VSS 단자, VCC 단자, DATA0 단자, DATA1 단자, DATA2 단자, DATA3 단자, BS 단자, CLK 단자, INS 단자가 설치되어 있다. Connection terminals of the memory card 1 has a terminal VSS, VCC terminal, terminal DATA0, DATA1 terminal, terminal DATA2, DATA3 terminal, BS terminals, CLK terminals, INS terminal are provided. 또, VSS 단자는 2개 설치되어 있기 때문에, 메모리 카드(1)에는 합계 10개의 접속 단자가 설치되어 있는 것이 된다. Also, VSS terminals, because the two are installed, the memory card 1 is that there is a total of 10 connection terminals are installed. 호스트 기기(2)측에도 마찬가지의 접속 단자가 설치되어 있다. Host apparatus 2 side as well there is a connecting terminal of the same is installed. VSS 단자는 VSS(기준 0볼트 전압)가 접속된다. VSS terminal is connected to the VSS (reference 0 volts). 이 VSS 단자는 호스트 기기측의 접지와 메모리 카드측의 접지를 접속하여, 호스트 기기와 메모리 카드와의 0볼트 기준 단위를 일치시킨다. This VSS terminal is connected to the ground of the host apparatus-side ground and the memory card side, to match the zero voltage reference unit of the host apparatus and memory card. VCC 단자는 전원 전압(VCC)이 호스트 기기로부터 공급된다. VCC terminal is the power supply voltage (VCC) from the host apparatus. DATA0 단자는 메모리 카드(1)와 호스트 기기(2)와의 사이에 전송되는 4비트 병렬 데이터 중의 최하위 비트의 데이터 신호(DATA0)가 입출력된다. DATA0 terminal, a memory card 1 and the host apparatus (2) of the least significant bit data signal (DATA0) of the 4-bit parallel data that is transmitted between the input and output is. DATA1 단자는 메모리 카드(1)와 호스트 기기(2)와의 사이에 전송되는 4비트 병렬 데이터 중의 하위로부터 2비트째 데이터 신호(DATA1)가 입출력된다. DATA1 terminal, a memory card 1 and the host apparatus (2) second bit data signal (DATA1) from the lower of the 4-bit parallel data that is transmitted between the input and output is. DATA2 단자는 메모리 카드(1)와 호스트 기기(2)와의 사이에 전송되는 4비트 병렬 데이터 중의 하위로부터 3비트째 데이터 신호(DATA2)가 입출력된다. DATA2 terminal is a 3-bit second data signal (DATA2) is input and output from the lower of the 4-bit parallel data transferred between the memory card 1 and host apparatus 2. DATA3 단자는 메모리 카드(1)와 호스트 기기(2)와의 사이에 전송되는 4비트 병렬 데이터 중의 하위로부터 4비트째 데이터 신호(DATA3)가 입출력된다. DATA3 terminal, a memory card 1 and host apparatus 2 4-bit second data signal (DATA3) from the lower of the 4-bit parallel data that is transmitted between the input and output is. BS 단자는 버스 스테이트 신호가 호스트 기기로부터 메모리 카드에 입력된다. BS terminal is a bus-state signal is input to the memory card from the host apparatus. CLK 단자는 클럭 신호가 호스트 기기(2)로부터 입력된다. CLK terminal is a clock signal is input from the host apparatus (2). INS 단자는 메모리 카드가 슬롯에 삽입되어 있거나, 삽입되어 있지 않은지를 호스트 기기(2)가 판단하기 위한 삽입/추출 검출에 이용된다. INS terminal is either a memory card is inserted in the slot and is used for that it is not inserted into the insertion / extraction detection to determine the host apparatus 2. 메모리 카드(1)의 INS 단자는 접지에 접속되어 있으며, 호스트 기기(2)의 INS 단자는 저항을 통하여 풀업되어 있다. INS terminal of the memory card 1 is connected to the ground, the INS terminal of the host apparatus 2 is pulled up through a resistor. 다음으로, 메모리 카드(1)와 호스트 기기(2)와의 사이의 데이터 전송을 하기 위한 인터페이스의 기능 구성을 도 5를 참조하여 설명한다. Next, it will be described with reference to Figure 5 the functional configuration of the memory card 1 and the interface for data transfer between the host apparatus 2. 호스트 기기(2)의 인터페이스 기능은, 도 5에 도시한 바와 같이 파일 매니저(31)와, TPC 인터페이스(32)와, 병렬 인터페이스(33)로 구성된다. Interface functions of the host device 2 is composed of a file manager 31, a TPC interface 32, a parallel interface 33, as shown in FIG. 또한, 메모리 카드(1)의 인터페이스 기능은 병렬 인터페이스(34)와, 레지스터(35)와, 데이터 버퍼(36)와, 메모리 컨트롤러(37)와, 메모리(38)로 구성된다. In addition, the interface function of the memory card 1 is composed of a parallel interface 34, a register 35, a data buffer 36, a memory controller 37 and a memory 38. 파일 매니저(31)는 호스트 기기의 오퍼레이션 시스템으로서, 메모리 카드(1) 내에 저장되어 있는 파일, 및 호스트 기기의 다른 미디어에 저장되어 있는 파일의 관리를 행한다. File Manager (31) is an operation system of the host device, and performs the management of the files stored in other media of the file, and the host device stored in the memory card (1). 본 실시의 형태에서는, 파일 매니저(31)는 오퍼레이션 시스템으로서 MS-DOS(Microsoft Disc Operation System)(등록상표)가 이용된다. In the present embodiment, the file manager 31 is a MS-DOS (Microsoft Disc Operation System) (registered trademark) as the operation system is used. 파일 매니저(31)는 MS-DOS에 의해 호스트 기기(2)에 접속되어 있는 다른 스토리지 미디어도 관리하고 있다. File Manager (31) has a different storage media by the MS-DOS is connected to the host apparatus (2) is also managed. 파일 매니저(31)는, 호스트 기기(2) 내의 컨트롤러 내에 실현되는 기능이다. File manager 31 is a function realized in the controller in the host apparatus 2. TPC 인터페이스(32)는 파일 매니저(31)의 하위층이 되는 인터페이스 기능이다. TPC interface 32 is an interface function which the lower layer of the file manager 31. TPC 인터페이스(32)는 본 인터페이스의 특유의 커맨드(TPC: Transfer Protocol Command)가 규정된 데이터 전송 프로토콜에 의해, 메모리 카드(1) 내의 레지스터(35) 및 데이터 버퍼(36)에 액세스를 행한다. It performs the access to the register 35 and data buffer 36 in the memory card (1) by the prescribed data transmission protocol: (Transfer Protocol Command TPC) TPC interface 32 is unique to a command of the interface. 이 TPC 인터페이스(32)는 호스트 기기(2) 내의 컨트롤러 등에 의해 실현되는 기능이다. This TPC interface 32 is a function realized by the controller in the host apparatus 2. 병렬 인터페이스(33, 34)는 TPC 인터페이스(32)의 하위층이 되고, 본 인터페이스 시스템의 물리 계층이다. A parallel interface (33, 34) is the lower layers of the TPC interface 32, a physical layer of the interface system. 병렬 인터페이스(33, 34)는 4비트 병렬 데이터, 클럭, 버스 스테이트 신호의 6개의 신호를 전송하는 데이터 전송 프로토콜인 6선식 반이중 병렬 프로토콜에 따라, 데이터 전송을 행한다. A parallel interface (33, 34) in accordance with the 4-bit parallel data, a clock, a half-duplex data transfer protocol for transferring six six-wire signal of the bus state signal parallel protocol, and performs data transfer. 병렬 인터페이스(33, 34)는 병렬 인터페이스 회로(12)에 의해 실현되는 기능이다. A parallel interface 33, 34 is a function realized by the parallel interface circuit 12. 레지스터(35)는 호스트로부터 전송된 컨트롤 커맨드, 메모리 카드의 내부 상태, 메모리(38)에 액세스하는 데이터의 어드레스, 컨트롤 커맨드를 실행할 때에 필요한 제반의 파라미터, 메모리 내의 파일 관리 정보 등을 저장한다. Register 35 stores the control command, the internal state of the memory card, the data access to the memory 38 the address, of the various parameters necessary for the control command to execute, such as the file management information in the memory transferred from the host. 레지스터(35)는 메모리 카드(1)의 레지스터 회로(13) 상에 실현되는 기능이다. Register 35 is a function realized on the register circuit 13 of the memory card (1). 데이터 버퍼(36)는 메모리(38)에 기입되는 데이터, 및 메모리(38)로부터 판 독된 데이터를 일시적으로 보존하는 버퍼 영역이다. Data buffer 36 is a buffer area for temporarily preserving the plate dokdoen data from the data, and the memory 38 is written in the memory 38. 데이터 버퍼(36)는 메모리 카드(1)의 데이터 버퍼 회로(14) 상에 실현되는 기능이다. Data buffer 36 is a function realized on the data buffer circuit 14 of the memory card (1). 메모리 I/F 컨트롤러(37)는 레지스터(35) 내에 저장되어 있는 커맨드 및 각종 정보에 따라, 데이터 버퍼(36)와 메모리(38) 사이의 데이터의 판독, 기입, 소거, 및 레지스터(35) 내의 각종 정보의 갱신 등의 제어를 행한다. In the memory I / F controller 37, the data buffer 36 and the memory 38, reading of data between the write, erase, and register 35 in accordance with commands and various information stored in the register 35 and it controls the updating, etc. of various kinds of information. 메모리 I/F 컨트롤러(37)는 호스트 기기(2) 상의 메모리 I/F 컨트롤러(16)에 의해 실현되는 기능이다. A memory I / F controller 37 is a function realized by the memory I / F controller 16 on the host device (2). 메모리(38)는 데이터의 메모리 영역으로서, 메모리 I/F 컨트롤러(37)를 통해서 독자적인 모델로서 가상화되어 있다. Memory 38 is a memory area of ​​the data, and is virtualized as a unique model via the memory I / F controller 37. 메모리(38)는 메모리 카드(1) 상의 불휘발성 반도체 메모리(17)에 의해 실현되는 기능이다. Memory 38 is a function realized by the non-volatile semiconductor memory 17 on the memory card (1). 이상과 같은 구성의 호스트 기기 및 메모리 카드에서는, 파일 매니저(31)에 의해 관리되고 있는 다른 미디어에 저장되어 있는 데이터를, 병렬 인터페이스(33, 34)를 통하여 메모리(38)에 전송할 수 있다. In the configuration of the host apparatus and memory card as described above, it can transmit the data stored in other media managed by the file manager 31, the memory 38 via the parallel interface (33, 34). 파일 매니저(31)는 본 메모리 카드와 다른 스토리지 디바이스를 오퍼레이션 시스템(MS-DOS)으로 공통으로 관리하고 있기 때문에, 예를 들면 메모리(38)에 저장되어 있는 데이터를 다른 스토리지 미디어에 전송하거나, 다른 스토리지 미디어에 저장되어 있는 데이터를 메모리(38)에 전송하거나 할 수 있다. File manager 31 has the memory card and the other storage device because the management in common to the operation system (MS-DOS), for example, the memory 38 transferred, or else the data stored in the different storage media the data stored in the storage media may transmit or to the memory 38. 다음으로, 메모리 카드(1)의 데이터 저장 영역(불휘발성 반도체 메모리(17))의 물리 포맷에 대하여 설명한다. Next is a description of a physical format of the memory card storage area of ​​the data (1) (non-volatile semiconductor memory 17). 메모리 카드(1)는 사용자에게 생성된 파일이 저장되는 사용자 에리어와, 본 메모리 카드(1)의 내부 정보 등이 저장되어 있는 시스템 에리어로 구성되어 있다. Memory card 1 may have a user area which the generated file to the user store, the internal information of the memory card 1 or the like is composed of a system area is stored. 사용자 에리어 및 시스템 에리어는, 모두 컨트롤 커맨드를 이용하여 호스트 기기(2)로부터 액세스가 가능하다. User area and the system area, it is possible to access both using the control command from the host apparatus (2). 단, 사용자 에리어와 시스템 에리어는, 상호 다른 어드레스 공간에 형성되어 있으며, 서로 다른 컨트롤 커맨드에 의해 호스트 기기(2)로부터 액세스가 행해진다. However, the user area and the system area is, is formed in the mutually different address spaces, and each access is performed from the host apparatus (2) by the other control commands. 사용자 에리어는, 예를 들면 64K바이트 또는 128K바이트의 블록이라고 불리는 단위로 물리적으로 분할되어 있다. User area is, for example, is physically divided into a unit called a block of 64K bytes or 128K bytes. 이 블록이 본 메모리 카드(1)에 있어서의 일괄 소거의 단위가 된다. The block is a unit of batch erase of the present memory card 1. 즉, 플래시 메모리에 있어서의 소거 블록이, 본 블록에 대응한다. That is, the erase block in the flash memory, and corresponds to the present block. 블록에는, 유효 블록 및 예비 블록의 2종류가 있다. Block, there are two kinds of the effective block and the spare block. 유효 블록은 파일의 실체 데이터 등이 기록되는 블록이다. Valid blocks are the blocks which are such as entity data of file records. 예비 블록은 후발성의 불량의 대체 데이터가 기록되는 영역이다. Spare block is an area in which replacement data is recorded in the Province late defective. 사용자 에리어는, 호스트 기기(2)로부터는 섹터 단위로 연속하는 에리어로서 인식되지만, 내부에서는 유효한 데이터를 기록하는 섹터 번호로부터 도출되는 논리 블록 번호와 물리 블록 번호로 관리되고 있다. User area is, from the host device 2, but is recognized as a continuous area on a sector-by-sector basis, the inside is maintained in a logical block number and the physical block number that is derived from the sector number for recording useful data. 논리 블록 번호와 논리 블록 번호와의 대응 정보는 물리 블록의 관리 에리어인 용장부에 기록함과 함께, 대응을 데이터화한 상태에서 호스트 기기(2)로부터는 액세스할 수 없는 시스템 에리어에 기록하고 있다. Information corresponding to the logical block number and the logical block number with girokham in the redundant area management of the physical block, from the host apparatus in a state corresponding to the ingestion (2) has been recorded in the system area with no access to. 각 블록에는 블록의 저장 위치를 특정하는 물리 블록 번호가 설정되어 있다. Each block has a physical block number is set to specify the storage location of the block. 이 물리 블록 번호는 유효 블록 및 예비 블록의 구별에 상관없이 단일 번호가 설정되어 있다. The physical block numbers are the single number is set irrespective of the distinction between the effective block and the spare block. 유효 블록에는 논리 블록 번호가 기록된다. The logical block number is recorded in the valid block. 논리 블록 번호는 각 블록 내의 소정의 영역에 기입된다. Logical block number is written to a predetermined area within each of the blocks. 논리 블록 번호는 본 메모리 카드(1)의 초기화 시에 기록된다. Logical block numbers is recorded upon initialization of the memory card (1). 블록에 불량이 생긴 경우에는, 미기록의 예비 블록에 대하여 불량 블록의 논리 블록 번호를 기입하여, 논리 블록 번호의 대체가 행해진다. If a defect has occurred in the block, and writes the logical block number of the bad block for the spare block of the non-recorded, it is carried out replacement of the logical block number. 각 블록 내에는 페이지라고 불리는 기입 판독 단위로 분할되어 있다. Within each block it is divided into a write-read unit called a page. 이 페이지가, 후술하는 논리 포맷에 있어서의 섹터와 일대일로 대응한다. The page, corresponds to the sector one-to-one in a logical format to be described later. 각 블록에 붙여지는 논리 블록 번호는, 후술하는 논리 포맷에 있어서의 클러스터 번호 및 LBA 섹터 번호와 일의적으로 대응한다. Logical block number attached to each block, the cluster number and sector number LBA, and uniquely corresponding to one of the logical format described below. 호스트 기기(2)측으로부터는, 후술하는 논리 포맷으로 데이터 저장 영역에 대하여 가상적으로 액세스가 되지만, 메모리 I/F 컨트롤러(16)가, 논리 블록 번호와 물리 블록 번호와의 대응 관계가 기술된 논리-물리 변환 테이블을 이용하여 어드레스 변환을 행한다. From the side of the host apparatus (2), the virtually the access to the data storage area as a logical format to be described later, but the memory I / F controller 16 is, the correspondence between the logical block number and the physical block number described logic - using the physical conversion table to perform the address translation. 그 때문에, 호스트 기기(2)측은 물리적으로 데이터가 기록되어 있는 위치를 파악하지 않아도, 논리적인 어드레스(클러스터 번호나 LBA 섹터 번호)를 이용하여 불휘발성 반도체 메모리(17)에 대하여 액세스를 행할 수 있게 된다. Therefore, the host apparatus 2 side physically enables data to be carried out the access with respect to the need to grasp the position that has been recorded, the logical addresses (cluster numbers or LBA sector number), the non-volatile semiconductor memory 17 by using the do. 다음으로, 시스템 에리어의 물리 포맷을 설명한다. Next, the physical format of the system area. 시스템 에리어에는, 본 메모리 카드(1)를 제어하기 위해서 필요한 정보가 기록되는 속성 정보 에리어가 형성되어 있다. System area is provided with a property information area is formed in which information is recorded need to control the memory card (1). 속성 정보 에리어에 기록되는 데이터는, 도 6에 도시한 바와 같은 구조를 갖는다. Data that is written to the attribute information area is, and has a structure as shown in Fig. 속성 정보 에리어에는, 도 6에 도시한 바와 같이 "ATRB info area confirmation", "Device-Information entry", "System information", "MBR Values", "PBR Values"가 기록되어 있다. Attribute information area, there is the one "ATRB info area confirmation", "Device-Information entry", "System information", "MBR Values", "PBR Values" recording as shown in Fig. "ATRB info area confirmation"에는 해당 속성 정보 에리어를 식별하기 위한 식별 코드가 포함되어 있다. "ATRB info confirmation area" includes an identification code for identifying the attribute information area. 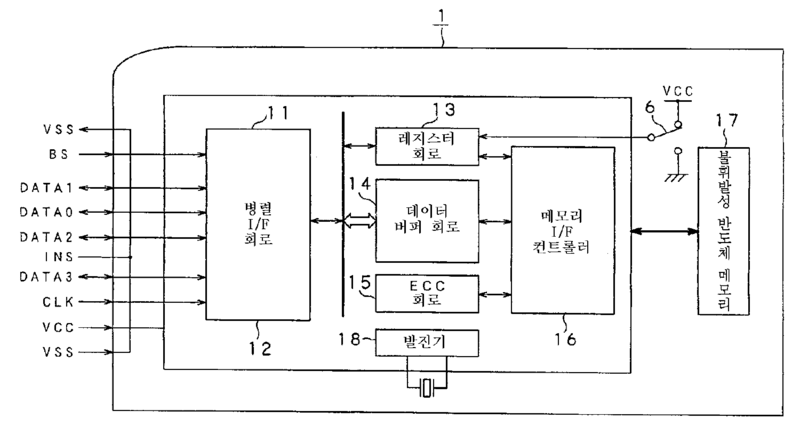 "Device-Information entry"는 이하의 "Device-Information(System information, MBR Values, PBR Values)"의 각 기록 위치를 나타낸다. "Device Information-entry" indicates a recording position of each "Device-Information (System information, MBR Values, PBR Values)" below. 기록 위치는 속성 정보 에리어의 오프셋값으로 표시된다. Recording position is represented by the offset value of the attribute information area. "System information"에는 본 메모리 카드(1)의 내부 정보가 기록된다. "System information" is recorded in the internal information of the memory card (1). 예를 들면, "System information"에는 버전이나 클래스 정보, 1블록의 바이트 수, 1블록에 포함되는 섹터수, 토탈 블록 수, 어셈블리 일시, 일련 번호, 어셈블리 메이커 번호, 플래시 메모리의 메이커 번호, 플래시 메모리의 모델 번호, 컨트롤러의 번호, 컨트롤러의 기능, 블록 경계의 개시 섹터 번호, 디바이스 타입(판독/기입 가능, 판독만 등) 등이 기록된다. For example, "System information", the number of sectors, a total of blocks included in the version and class information, the number of bytes for one block, one block, assembly date, serial number, assembly maker code, a flash memory maker code, a flash memory is a model number, number of controllers, functions of the controller, the start sector number of a block boundary, such as the device type (read / write enable, read only, etc.) is recorded. 또, "System information"에 기록되어 있는 「1블록에 포함되는 섹터 수」 및 「블록 경계의 개시 섹터 번호」는 호스트 기기(2)가 「리얼타임 기록 모드」로 데이터를 기록할 때에 참조되게 된다. In addition, "start sector number of a block boundary" "System information", "number of sectors included in the first block" and recorded in the are to be referenced when the host device 2 writes data in "real-time recording mode." . 「리얼타임 기록 모드」의 처리에 대해서는 그 상세를 후술한다. It will be described later in detail for the processing of "real-time recording mode". "MBR Values"에는 MS-DOS 상에서 규정되어 있는 「MBR」(Master Boot Record)의 추천 파라미터가 기록되어 있다. "MBR Values" has recommended parameters of "MBR" (Master Boot Record), which is defined on the MS-DOS is recorded. 예를 들면, "MBR Values"에는 MBR 내에 기록되는 부팅 식별, 개시 헤드 번호, 개시 실린더 번호, 시스템 식별, 최종 헤드 번호, 최종 섹터 번호, 최종 실린더 번호, 개시 LBA 섹터 번호, 파티션 사이즈가 기록된다. For example, "MBR Values", the boot identified, initiating the head number, the starting cylinder number, the system identification, the final head number, the end sector number, the last cylinder number, a start LBA sector number, partition size recorded in the MBR is recorded. 개시 LBA 섹터 번호로 나타낸 섹터가, 「PBR」(Partition Boot Record)의 기록 위치가 된다. Discloses a sector indicated by sector number LBA, that is the recording position of the "PBR" (Partition Boot Record). 즉, MS-DOS 상에서 규정되어 있는 각 파티션의 개시 위치가 된다. That is, the starting position of each partition, as defined on the MS-DOS. 또, MS-DOS에서는 1개의 스토리지 미디어 내에, 복수의 파티션을 형성할 수 있게 되어 있지만, 본 예에서는 불휘발성 반도체 메모리(17)에 형성되는 파티션은 1개인 것으로 하고 있다. Further, although in the MS-DOS in one storage medium, it becomes possible to form a plurality of partitions, in this embodiment, the partition is formed in the non-volatile semiconductor memory 17 has to be one person. 본 발명은 1개의 파티션을 형성한 경우의 메모리 카드에 한정하여 적용되는 것이 아니고, 복수의 파티션을 형성한 경우의 메모리 카드에 적용해도 된다. The present invention is not limited to the application to the memory card in the case of forming the first partitions, it may be applied to a memory card, in the case of forming a plurality of partitions. "PBR Values"에는 MS-DOS 상에서 규정되어 있는 「PBR」의 추천 파라미터가 기록되어 있다. "PBR Values" is recorded like a parameter of "PBR", as defined on the MS-DOS. 예를 들면, "PBR Values"에는 PBR 내에 기록되는 점프 코드, OEM명과 버전, 1섹터당 바이트 수, 1클러스터당 섹터 수, 예약 섹터 수, FAT(File Allocation Table) 수, 루트 디렉토리 엔트리의 엔트리 수, 미디어 내의 섹터 수, 미디어 ID, 1FAT당 섹터 수, 1헤드당 섹터 수, 헤드 수, 은폐 섹터 수, 논리 섹터의 합계 수, 물리 드라이브 번호, 확장 부팅 식별, 볼륨의 일련 번호, 볼륨 라벨, 파일 시스템 타입이 기록된다. For example, "PBR Values", the number of sectors per jump code, number of bytes per OEM name and version, one sector, one cluster is recorded in the PBR, be reserved sectors, FAT (File Allocation Table) number, the number of entries in the root directory entry , the number of sectors in the media, the media ID, the number of sectors per 1FAT, number of sectors per one head, the head can, cover sectors, the total number of logical sectors, physical drive number, and extension identify boot, serial number, volume label, files in a volume this type of system is recorded. 본 발명에 따른 메모리 카드(1)의 데이터 저장 영역(불휘발성 반도체 메모리(17))의 물리 포맷은, 이상과 같이 구성되어 있다. A physical format of the memory card storage area of ​​the data (1) (non-volatile semiconductor memory 17) according to the present invention is configured as described above. 또, 본 발명에 따른 메모리 카드(1)에는, 컨트롤 커맨드로서, 속성 정보를 판독하는 커맨드(READ_ATRB)가 설정되어 있다. Further, in the memory card 1 according to the present invention, there is provided a control command, a command (READ_ATRB) for reading the attribute information it is set. 호스트 기기(2)는 "MBR Values" 및 "PBR Values"를 READ_ATRB 커맨드를 이용하여 판독함으로써, 어셈블리 메이커에 의해 추천되는 논리 포맷으로, 메모리 카드(1)를 초기화할 수 있게 된다. By the host apparatus 2 is "MBR Values" and "PBR Values" read using the READ_ATRB command, a logical format to be referred by the assembly maker, it is possible to initialize the memory card (1). 또한, 본 메모리 카드(1)에는 컨트롤 커맨드로서, 불휘발성 반도체 메모리(17)를 초기화하는 커맨드(FORMAT)가 설정되어 있다. In addition, the memory card 1 has a command (FORMAT) to a control command, initializing the non-volatile semiconductor memory 17 are set. 호스트 기기(2)는 메모리 카드(1)에 대하여 FORMAT 커맨드를 받으면, 메모리 I/F 컨트롤러(16)가 속성 정보 에리어 내에 기록되어 있는 "MBR Values" 및 "PBR Values"를 참조하여, 이 "MBR Values" 및 "PBR Values"의 내용에 따라 불휘발성 반도체 메모리(17)를 초기화한다. The host apparatus (2) receives a FORMAT command to the memory card 1, the memory I / F controller 16, refer to the recorded in the attribute information area "MBR Values" and "PBR Values", the "MBR Values ​​"and" initialize-volatile semiconductor memory 17 in accordance with the teachings of the fire PBR Values ​​". 메모리 카드(1)의 초기화에 대해서는, 그 상세를 후술한다. For the initialization of the memory card 1 will be described below in detail. 다음으로, 본 발명에 따른 메모리 카드(1)에 적용되는 논리 포맷에 대하여 설명한다. Next is a description of the logical format that is applied to the memory card 1 according to the invention. 본 발명에 따른 메모리 카드에서는, 데이터 저장 영역에 대한 논리 포맷으로서, MS-DOS 호환 포맷을 채용하고 있다. The memory card according to the present invention, there is provided a logical format for a data storage area, and employs the MS-DOS compatible format. MS-DOS 호환 포맷은 계층 디렉토리 구조로 미디어 내에 기록되어 있는 데이터 파일을 관리하는 파일 시스템이다. MS-DOS-compatible format is a file system that manages the data files recorded in the media in a hierarchical directory structure. MS-DOS 호환 포맷에서는 실린더, 헤드, 섹터라고 불리는 단위로 미디어에 대하여 데이터의 액세스가 행해진다. In MS-DOS-compatible format is carried out to access the data to media in a unit called the cylinders, heads, and sectors. 미디어에 대한 실제 데이터의 판독/기입의 단위는 섹터가 된다. The units of the read / write of data for the actual media is a sector. 또한, MS-DOS 호환 포맷에서는 기록되어 있는 데이터를 관리하는 데 있어서 클러스터라는 단위를 정하고 있다. In the MS-DOS compatible format stipulates the units of the cluster in managing the data recorded. 클러스터의 사이즈는 섹터의 사이즈의 배수가 된다. The size of the cluster is a multiple of the size of the sector. 예를 들면, 64섹터로 1클러스터가 구성된다. For example, the first cluster consists of 64 sectors. 호스트 기기(2)측의 오퍼레이션 시스템 상에서는, 클러스터 단위로 파일의 관리가 행해진다. On the operation system of the host apparatus 2 side, and is performed in cluster units in the management file. 본 발명에 따른 메모리 카드(1)에 적용되는 논리 포맷에서는, 블록의 사이즈보다 클러스터의 사이즈가 작고, 또한 클러스터의 사이즈의 n배(n은 2 이상의 정 수)가 1개의 블록의 사이즈가 된다. The logical format to be applied to the memory card 1 according to the present invention, the small size of the cluster than the size of the block, and n times (Modification and n is 2 or more) of the size of the clusters is the size of one block. 예를 들면, 1블록의 데이터 사이즈가 128K바이트인 경우, 1클러스터의 데이터 사이즈가 32K바이트, 즉 1개의 블록 내에 4클러스터가 기록된다. For instance, the four clusters is recorded in the case where the data size of one block of 128K bytes, the data size of one cluster 32K bytes, that is, one block. 본 발명에 따른 메모리 카드(1)에 적용되는 논리 포맷은, 블록의 경계 위치가 반드시 클러스터의 경계 위치와 일치하도록, 설정된다. Logical format to be applied to the memory card 1 according to the invention is, set the boundary position of the block so as to be consistent with the position of the boundary cluster. 즉, 1개의 클러스터가 2개의 블록에 걸치지 않도록 설정된다. That is, it is set so that one cluster not extend across two blocks. 논리 포맷을 이상과 같은 조건으로 설정하기 위해서는, MS-DOS의 파일 관리 데이터(MBR, PBR, FAT, 루트 디렉토리)의 기록 위치나, 각 파일 관리 데이터 내에 기록되는 파라미터를 조정하면 된다. In order to set the logical format on the condition as described above, may be adjusted to the parameters recorded in the MS-DOS file management data (MBR, PBR, FAT, the root directory), the recording position or, each file management data of the. 이러한 조건으로 논리 포맷을 행하기 위한 파라미터는, 속성 정보 내의 "MBR Values" 및 "PBR Values"에 기록되어 있다. Parameters for performing a logical format in this condition, is recorded in the "MBR Values" and "PBR Values" in the attribute information. MS-DOS의 파일 관리 데이터의 내용은 이하와 같다. The contents of the MS-DOS file management data is as follows. MBR은 사용자 영역의 선두에 배치된다. MBR is disposed at the head of the user area. MBR 내에 기술되는 내용은 속성 정보 내의 "MBR Values"에 기술되는 내용과 마찬가지이다. Contents written in the MBR is the information similar to that described in the "MBR Values" in the attribute information. PBR은 각 파티션의 선두 섹터에 배치된다. PBR is disposed at the head sector of each partition. PBR이 기록되어 있는 섹터는 MBR 내의 개시 LBA 섹터 번호에 기술되어 있다. A sector that is PBR is recorded is described in the start sector number LBA in the MBR. 또, LBA 섹터 번호는, 유효 블록 내, 또는 유효 블록으로부터 대체된 대체 블록의 각 섹터에 고유하게 붙여진 번호이다. Moreover, LBA sector number is a valid block, or in number uniquely attached to each sector of the replacement block from the effective replacement block. LBA 섹터 번호는 논리 블록 번호가 0의 블록의 선두 섹터로부터, 올림 차순으로 붙여져 있다. LBA sector number from the head sector of the block of the logical block number 0, and attached in ascending order. FAT는 PBR에 이어지는 다음의 섹터로부터, 복수의 섹터에 걸쳐 기록된다. The FAT sectors from the next, leading to PBR, is recorded over a plurality of sectors. FAT는 사용자 영역에서 처리되는 파일의 연결 상태를 클러스터 단위로 나타내고 있 다. FAT there is shown the connection of the file is processed in the user area in cluster units. 미디어 상에 기록되어 있는 데이터는 클러스터 단위로 관리되고 있지만, 1개의 파일의 본체가 복수의 클러스터에 걸치는 경우에는, 1개의 클러스터를 마지막까지 판독한 후에, 다음의 클러스터를 판독해야 한다. Although the data recorded on the medium is managed in cluster units, when the main body of the one file over a plurality of clusters, after reading the one cluster to the end, it should be read out subsequent clusters. 그러나, 다음의 클러스터는 반드시 물리적으로 연속하는 위치에 기록되어 있다고는 한정되지 않는다. However, the subsequent clusters are not necessarily limited that is recorded in a position physically continuous. 그 때문에, 호스트 기기(2)는 미디어 상에 기록되어 있는 데이터에 대하여 액세스를 행하는 경우, 임의의 1개의 클러스터에 이어지는 클러스터가, 어떤 클러스터인지를 나타내는 정보가 필요하게 된다. For this reason, it becomes the host apparatus (2) requires the information indicating whether the case of performing the access to the data recorded on the media, the leading cluster to any one of the cluster, which cluster. 이러한 정보가 기록되어 있는 것이 FAT이다. It is in this FAT information is written. FAT에는 미디어 상에 존재하는 클러스터 수와 동일한 만큼의, 저장 영역이 형성되어 구성되고 있다. FAT has been configured, the storage of the same as the number of clusters present on the media is formed. 미디어 상에 존재하는 모든 클러스터에는 02(16진수)부터 시작되는 클러스터 번호가 붙여져 있다. All clusters that exist on the media has attached the cluster numbers starting with 02 (hex). FAT 내의 각 저장 영역에는 클러스터 번호가 일의적으로 할당된다. Each storage area in the FAT, the cluster number is uniquely assigned to the work. 각 저장 영역에는 자기가 할당되어 있는 클러스터에 접속한 다음의 클러스터의 번호가 저장된다. Each storage contains a number of the next cluster of the cluster that are connected to the self-assigned and stored. 이 때문에, 임의의 클러스터에 접속되는 다음의 클러스터를 찾아내고자 하는 경우에는, 그 클러스터가 할당되어 있는 저장 영역에 저장되어 있는 번호를 참조하면 된다. For this reason, when the case is to try to find the next cluster of the cluster, which is connected to any reference to the number stored in the storage area in which the cluster is allocated. 또, 본 메모리 카드(1)에서는 백업을 위해, 2개의 FAT(FAT1, FAT2)를 기록하고 있다. In addition, for backup in the present memory card 1, and records the FAT 2 (FAT1, FAT2). 또, 1개의 FAT의 물리적인 데이터 사이즈는 미디어 내의 클러스터 수가 변화하지 않기 때문에, 데이터 내용이 갱신했다고 해도 반드시 일정하게 된다. Also, physical data size of the FAT is one even if it does not change the number of clusters in the media, the data content is updated will be constant. 루트 디렉토리 엔트리는 루트 디렉토리에 배치되는 각 파일 및 서브 디렉토리의 엔트리 정보가 기술된다. The root directory entry are described in the entry information of each of the files and subdirectories in the root directory is placed. 루트 디렉토리 엔트리는 FAT가 기록된 최종 섹터에 이어지는 다음의 섹터로부터 기록된다. Root directory entries are recorded from the next sector following the last sector of the FAT is recorded. 1개의 엔트리 정보의 바이트 수는 규정값이고, 또한 루트 디렉토리 엔트리에 배치되는 엔트리 수도 규정값이 된다. The number of bytes of one entry information is the specified value, and the entry is also defined value is placed in the root directory entry. 그 때문에, 루트 디렉토리 엔트리의 데이터 사이즈는 반드시 일정하게 된다. Therefore, the data size of the root directory entry is to be constant. 또, MS-DOS 호환 포맷의 확장형인 FAT32 파일 시스템에서는 루트 디렉토리 엔트리의 특별 취급은 폐지되고, 루트 디렉토리 엔트리도 클러스터의 관리화에 놓인다. In addition, MS-DOS-extended in the FAT32 file system format compatible special treatment of the root directory entry is abolished, the root directory entry is also placed on the management screen of the cluster. MS-DOS 호환 포맷에서는 이상의 파일 관리 데이터에 이어지는 다음의 섹터로부터, 최초의 클러스터(클러스터 번호 "02")가 개시된다. From the MS-DOS, and then the leading sector in the file management data over the compatible format, the first cluster (cluster number "02") is disclosed. 즉, 루트 디렉토리 엔트리가 기록된 최종 섹터의 다음의 섹터 이후가, 사용자에 의해 생성된 실제 파일이 기록되는 영역이 된다. That is, the root directory entry, and then the subsequent sector of the last sector recorded and the area where the actual file is written, created by the user. 따라서, 본 메모리 카드(1)에서는 이 클러스터 번호 02의 최초의 섹터가, 반드시 블록의 선두 섹터로 되도록, 상기의 파일 관리 데이터가 기록된다. Accordingly, the present memory card 1 in the first sector of the cluster number 02, necessarily, recorded in the file management data so that the head sector of the block. 본 메모리 카드(1)에서는 사용자 영역 내의 어느 하나의 블록의 개시 섹터의 LBA 섹터 번호가, 속성 정보 내의 「블록 경계의 개시 섹터 번호」에 기술된다. The memory card 1 in the LBA sector number of the start sector of one block in the user area, is described in the "Disclosure of the block boundary sector number" in the attribute information. 또, 본 발명에 따른 메모리 카드(1)에는, 소위 수퍼플로피 방식이라고 하는 포맷을 적용해도 된다. Further, in the memory card 1 according to the present invention, it may be applied the format of the so-called super-floppy system. 수퍼플로피 방식에서는 상술한 MBR에 상당하는 관리 데이터가 존재하지 않고, PBR이 사용자 영역의 선두에 기록된다. In the super-floppy method does not have the management data corresponding to the above-described MBR, PBR is recorded at the head of the user area. 본 발명은 MS-DOS 호환 포맷에 한정되지 않고, 수퍼플로피 방식과 같은 MBR이 존재하지 않는 포맷에도 적용할 수 있다. The present invention is not limited to MS-DOS compatible format, may also be applied to format does not exist, the MBR, such as a super-floppy system. 다음으로, 호스트 기기(2)에 의한 메모리 카드(1)의 초기화 처리, 및 데이터 기록 처리에 대하여 설명한다. Next is a description of the initialization process, and the data writing process of the memory card 1 by the host apparatus 2. 본 발명에 따른 메모리 카드(1)를 호스트 기기(2)의 오퍼레이션 시스템으로부터 참조 가능하게 하기 위해서는, 메모리 카드(1)를 MS-DOS의 파일 시스템으로 초기화할 필요가 있다. In order to enable reference to the memory card 1 according to the invention from the operation system of the host apparatus 2, it is necessary to initialize the memory card 1 to the MS-DOS file system. 초기화 처리는, 적어도 파일 관리 데이터(MBR, PBR, FAT, 루트 디렉토리 엔트리)의 기록을 행하면 된다. Initialization process is performed in the recording of at least a file management data (MBR, PBR, FAT, root directory entry). 초기화 처리는, 통상 메모리 카드(1)의 공장 출하 시에 행해지고 있지만, 필요에 따라 사용자가 행할 수도 있다. Initial processing is done at the factory, but the normal memory card 1, the user may be performed, if necessary. 본 메모리 카드(1)에 대하여 초기화 처리를 행하기 위해서는, 두 가지 방법이 있다. In order to perform the initialization process on the memory card 1, there are two ways. 제1 방법은 기입용의 컨트롤 커맨드를 이용하여 필요한 데이터를 소정의 섹터에 기입해 가는 방법이다. The first method is the necessary data with the control command of the writing going to write to a given sector. 제2 방법은 초기화용의 컨트롤 커맨드를 이용하는 방법이다. The second method is a method of using a control command for initialization. 상기 제1 방법 및 제2 방법을 설명하는 데 있어서, 우선 컨트롤 커맨드에 대하여 설명한다. In explaining the first method and the second method will be described with respect to the first control command. 메모리 카드(1)에서는 메모리 I/F 컨트롤러(16)에 대하여, 호스트 기기(2)로부터 동작 제어 커맨드가 전송되는 것이, 인터페이스 프로토콜 상에서 정해져 있다. Memory card 1 is fixed on to the internet interface protocol that is to the memory I / F controller 16, the operating control command transmitted from the host apparatus 2. 컨트롤 커맨드는 호스트 기기(2)로부터 TPC 중의 커맨드 세트 명령에 의해 레지스터 회로(13) 내의 커맨드 레지스터에 저장된다. Control command is stored in the command register in the register circuit 13 by the command set of the TPC command from the host apparatus (2). 메모리 I/F 컨트롤러(16)는 커맨드 레지스터 내에 컨트롤 커맨드가 저장되면, 그 컨트롤 커맨드에 대응한 동작 제어를 실행한다. If the memory I / F controller 16 is the control command is stored in the command register, and executes a control operation corresponding to the control command. 컨트롤 커맨드에는, 예를 들면 불휘발성 반도체 메모리(17)로부터 데이터 버퍼 회로(14)에 데이터를 판독하는 커맨드, 데이터 버퍼 회로(14)로부터 불휘발성 반도체 메모리(17)에 데이터를 기입하는 커맨드, 불휘발성 반도체 메모리(17) 상의 데이터를 소거하는 커맨드, 본 메모리 카드(1)를 공장 출하 상태로 복귀하는 포맷 커맨드, 메모리 카드(1)의 발진기(18)의 동작을 정지시키는 슬립 커맨드 등이 있다. Control command, for example a non-volatile semiconductor memory 17 from the data buffer circuit 14, a command for reading data to the data buffer circuit 14 to write the data in the non-volatile semiconductor memory 17 from the command, the fire and the like sleep command for stopping the operation of the volatile semiconductor memory 17 to the command, the memory card (1) for erasing a data format of the oscillator 18 of the command, the memory card 1 to return to its original state on. 이하에, 컨트롤 커맨드의 구체예를 설명한다. The following will describe a specific example of the control command for example. READ_DATA 커맨드는 불휘발성 반도체 메모리(17)의 사용자 에리어의 지정 어드레스로부터 데이터를 연속적으로, 판독해 가는 명령이다. READ_DATA command data successively from the designated address in the user area of ​​the nonvolatile semiconductor memory 17, a read command to go. 메모리 I/F 컨트롤러(16)는 이 READ_DATA 커맨드가 주어지면, 레지스터 회로(13) 내의 어드레스 레지스터에 저장되어 있는 어드레스를 참조하여, 불휘발성 반도체 메모리(17) 상의 어드레스에 대하여 액세스를 행하고, 이 어드레스로부터 데이터를 판독해 간다. A memory I / F controller 16 is given the READ_DATA command is, referring to the address stored in the address register in the register circuit 13 and performs an access with respect to the address within the nonvolatile semiconductor memory 17, the address it goes from the read data. 판독한 데이터는 일단 데이터 버퍼 회로(14)로 전송한다. The read-out data is temporarily transferred to the data buffer circuit 14. 메모리 I/F 컨트롤러(16)는 데이터 버퍼 회로(14)가 가득차면, 즉, 512바이트분 데이터를 판독하면, 호스트 기기(2)에 대하여 전송 요구의 인터럽트를 발행한다. A memory I / F controller 16 is a full side data buffer circuit 14, that is, when reading the 512 bytes of data, and issues an interruption for transfer request to the host apparatus (2). 그리고, 호스트 기기(2)에 의해 데이터 버퍼 회로(14) 내의 데이터가 판독되면, 계속되는 데이터를 불휘발성 반도체 메모리(17)로부터 데이터 버퍼 회로(14)로 전송해 간다. And, when the data in the data buffer circuit 14 is read out by the host apparatus 2, the flow then transfers the subsequent data from the non-volatile semiconductor memory 17 to the data buffer circuit 14. 메모리 I/F 컨트롤러(16)는 레지스터 회로(13) 내의 데이터 카운트 레지스터에 저장되어 있는 수만큼 데이터를 판독할 때까지, 이상의 처리를 반복한다. A memory I / F controller 16 repeats the above processing until the number of reading by the data stored in the data count register in the register circuit 13. WRITE_DATA 커맨드는 데이터 버퍼 회로(14)에 저장되어 있는 데이터를, 불휘발성 반도체 메모리(17)의 사용자 에리어의 지정 어드레스로부터 데이터를 연속적으로 기록해 가는 명령이다. WRITE_DATA is a command instruction going down the data stored in the data buffer circuit 14, the data from the designated address in the user area of ​​the non-volatile semiconductor memory 17 successively. 메모리 I/F 컨트롤러(16)는 WRITE_DATA 커맨드가 주어지면, 레지스터 회로(13) 내의 데이터 어드레스 레지스터에 저장되어 있는 어드레스를 참조하여, 불휘발성 반도체 메모리(17) 상의 어드레스에 대하여 액세스를 행하고, 이 어드레스로부터 데이터를 기입해 간다. A memory I / F controller 16 is given the WRITE_DATA commands by referring to the address stored in the data address register in the register circuit 13 performs an access with respect to the address within the nonvolatile semiconductor memory 17, the address it goes from the write data. 기입하는 데이터는 데이터 버퍼 회로(14)에 저장되어 있는 데이터이다. Write data that is the data stored in the data buffer circuit 14. 메모리 I/F 컨트롤러(16)는 데이터 버퍼 회로(14) 내부가 비게 되면, 즉 512바이트분 데이터를 기입하면, 호스트 기기(2)에 대하여 전송 요구의 인터럽트를 발행한다. A memory I / F controller 16 when the data buffer circuit 14 becomes empty inside, that is, when writing 512 bytes of data, and issues an interruption for transfer request to the host apparatus (2). 그리고, 호스트 기기(2)에 의해 데이터 버퍼 회로(14) 내에 데이터가 기입되면, 연속하는 데이터를 데이터 버퍼 회로(14)로부터 불휘발성 반도체 메모리(17)에 기입해 간다. Then, when the data is written into the data buffer circuit 14 by the host apparatus (2), and then written to the nonvolatile semiconductor memory 17 for data continuous from the data buffer circuit 14. 메모리 I/F 컨트롤러(16)는 레지스터 회로(13) 내의 데이터 카운트 레지스터에 저장되어 있는 수만큼 데이터를 기입할 때까지, 이상의 처리를 반복한다. A memory I / F controller 16 repeats the above processing until the number of write data stored in the data count register in the register circuit 13. READ_ATRB 커맨드는 불휘발성 반도체 메모리(17)로부터 속성 정보를 판독하는 명령이다. READ_ATRB command is a command for reading out attribute information from the non-volatile semiconductor memory 17. 메모리 I/F 컨트롤러(16)는 이 READ_ATRB가 주어지면, 불휘발성 반도체 메모리(17) 내의 속성 정보를 판독하여, 데이터 버퍼 회로(14)에 전송한다. A memory I / F controller 16 to the READ_ATRB is given, the reading out attribute information in the nonvolatile semiconductor memory 17, and transfers it to the data buffer circuit 14. FORMAT 커맨드는 불휘발성 반도체 메모리(17)로부터 속성 정보를 판독하고, 이 속성 정보 내의 "MBR Values" 및 "PBR Values"를 판독하여, 그 값에 따라, 불휘발성 반도체 메모리(17) 내에 MBR, PBR, FAT, 루트 디렉토리 엔트리를 기입해 간다. FORMAT command reads the attribute information from the non-volatile semiconductor memory 17, and reads the "MBR Values" and "PBR Values" in the attribute information, in a non-volatile semiconductor memory 17 in accordance with the value MBR, PBR , FAT, go to the root directory entry written. 이상이 컨트롤 커맨드의 설명이다. Thus, the description of the control command. 메모리 카드(1)를 제1 방법으로 초기화하는 경우에는, 호스트 기기(2)는 READ_ATRB 커맨드를 이용하여, 속성 정보 내의 "MBR Values" 및 "PBR Values"를 판 독한다. To initialize the memory card (1) in a first method, the host apparatus 2 using the READ_ATRB command and reading the "MBR Values" and "PBR Values" in the attribute information board. 그리고, 판독한 "MBR Values" 및 "PBR Values"에 기술되어 있는 값을 참조하여, MBR, PBR, FAT, 루트 디렉토리를 생성한다. And, with reference to the value written in the read-out "MBR Values" and "PBR Values", and generates a MBR, PBR, FAT, root directory. 그리고, 또한 "MBR Values" 및 "PBR Values"에 기술되어 있는 소정의 섹터에 대하여, WRITE_DATA 커맨드를 이용하여, 생성한 MBR, PBR, FAT, 루트 디렉토리 엔트리를 기입해 간다. And, also goes to fill the root directory entry, generated MBR, PBR, FAT, with the WRITE_DATA commands for a given sector which is described in the "MBR Values" and "PBR Values". 이러한 처리를 행함으로써, 메모리 카드(1)가 초기화되어, 호스트 기기(2)에 의해 참조 가능하게 된다. By carrying out this processing, the memory card 1 is initialized, it is possible to see by a host device (2). 또, MBR, PBR, FAT, 루트 디렉토리 엔트리의 값은, 속성 정보 내의 "MBR Values" 및 "PBR Values"에 따르지 않고, 호스트 기기(2)가 독자적으로 생성해도 된다. In addition, MBR, the value of the PBR, FAT, root directory entry is, without following the "MBR Values" and "PBR Values" in the attribute information, the host apparatus 2 that may be independently generated. 메모리 카드(1)를 제2 방법으로 초기화하는 경우에는, 호스트 기기(2)는 FORMAT 커맨드를 호스트 기기(2)의 메모리 I/F 컨트롤러(16)에 제공한다. To initialize the memory card (1) to the second method, and the host apparatus (2) provides a FORMAT command to the memory I / F controller 16 of the host apparatus (2). 메모리 I/F 컨트롤러(16)는 FORMAT 커맨드가 주어지면, 속성 정보 내의 "MBR Values" 및 "PBR Values"를 판독한다. A memory I / F controller 16 is given the FORMAT command, reads out the "MBR Values" and "PBR Values" in the attribute information. 그리고, 메모리 I/F 컨트롤러(16)는 판독한 "MBR Values" 및 "PBR Values"에 기술되어 있는 값에 기초하여, "MBR Values" 및 "PBR Values"에 기술되어 있는 소정의 섹터에 대하여, 불휘발성 반도체 메모리(17)에 대하여 MBR, PBR, FAT, 루트 디렉토리 엔트리를 기입해 간다. Then, the memory I / F controller 16 is based on the value described in the "MBR Values" and "PBR Values" reading, for a given sector which is described in the "MBR Values" and "PBR Values", with respect to the non-volatile semiconductor memory 17 goes to MBR, enter the PBR, FAT, root directory entry. 이러한 처리를 행함으로써, 메모리 카드(1)가 초기화되어, 호스트 기기(2)에 의해 참조 가능하게 된다. By carrying out this processing, the memory card 1 is initialized, it is possible to see by a host device (2). 이상과 같이 본 발명에 따른 메모리 카드(1)에서는 호스트 기기(2)가 기입용의 커맨드(WRITE-DATA 커맨드)를 이용하여, 호스트 기기(2) 자신이 생성한 파라미터를 기입하면서 초기화를 행하는 방법과, 호스트 기기(2)가 초기화용의 커맨드(FORMAT 커맨드)를 이용하여, 메모리 카드(1)가 자동적으로 초기화를 행하는 방법의 2종류의 초기화를 선택적으로 행할 수 있게 된다. In the memory card 1 according to the present invention as described above by using the command (WRITE-DATA command) for writing a host apparatus (2), a method of performing the initialization and writing the host apparatus (2) parameters that it generates and, by using the command (FORMAT command) for the host apparatus (2) is initialized, it is possible to selectively carry out the memory card 1 is automatically two types of initialization methods for performing initialization. 호스트 기기(2)에서는, 메모리 카드(1)에 대하여 초기화를 행하는 경우에, 초기화용의 커맨드(FORMAT 커맨드)를 이용할 수 있기 때문에, 각 파티션이나 규격마다 대응한 전용의 파라미터나 초기화 처리 프로그램을 내장할 필요가 없어져, 용이하게 초기화를 행할 수 있다. The host apparatus (2), built-in memory card (1) when performing initialization with respect to a, it is possible to use a command (FORMAT command) for initialization, the parameter and the initialization of only one response for each partition or a standard treatment program needs to be eliminated, it is possible to easily perform the initialization. 계속해서, 호스트 기기(2)로부터 메모리 카드(1)에 대하여 데이터를 기록하는 경우의 동작에 대하여, 도 7을 참조하여 설명한다. Next, the operation in the case of writing data to the memory card 1 from the host apparatus 2 will be described with reference to FIG. 호스트 기기(2)는 메모리 카드(1)가 슬롯에 장착되면, 속성 정보를 판독하는 커맨드(READ_ATRB 커맨드)를 이용하여, 속성 정보 내의 "System information"로부터, 「1블록에 포함되는 섹터 수」 및 「블록 경계의 개시 섹터 번호」를 판독한다(단계 S11). When the host apparatus 2 is mounted on the memory card (1) slot, using a command (READ_ATRB command) for reading the attribute information, the "number of sectors included in the first block", from the "System information" in the attribute information, and It reads the "start sector number of a block boundary" (step S11). 계속해서, 호스트 기기(2)는 사용자에 의해 기록 동작이 개시될 때까지, 처리를 대기한다(단계 S12). Subsequently, the host apparatus 2 waits for processing by the beginning of the recording operation by the user (step S12). 사용자에 의해 기록 동작이 개시되면, 현재의 기록 모드가 리얼타임 기록 모드인지, 통상 기록 모드인지를 판단한다(단계 S13). If a user initiated a write operation, it is determined whether the current recording mode is the recording mode or a real-time, the normal write mode (step S13). 기록 모드가 통상 기록 모드인 경우에는 단계 S14로 진행하고, 리얼타임 기록 모드인 경우에는 단계 S15로 진행한다. If the recording mode is the case of the normal recording mode, the procedure proceeds to step S14, the real-time recording mode, the process proceeds to step S15. 여기서, 리얼타임 기록 모드는, 예를 들면 동화상 신호의 실시간 기록을 행하는 경우 등의 기록 데이터의 생성 처리에 대하여 데이터 기록 처리가 추종해야 하는 기록 처리나, 대용량 데이터의 기록 처리 등의 고속 기록이 요구되는 기록 처 리인 경우에, 적용되는 모드이다. Here, the real-time recording mode is, for example, the recording process for the data recording process should follow with respect to the generation of the record data, such as the case of performing the real-time recording of video signal or, requiring high-speed recording, such as recording processing of large volumes of data in which the recording destination Reinforced case, the mode to be applied. 그에 대하여, 통상 기록 모드는, 예를 들면 정지 화상 신호의 기록을 행하는 경우 등의 고속 기록이 요구되지 않는 경우의 기록 모드이다. Respect thereto, the normal recording mode is, for example, a recording mode for high-speed recording is not required, such as when g for recording the still image signal. 리얼타임 기록과 통상 기록의 모드 선택은 사용자가 수동으로 설정해도 되고, 호스트 기기(2)가 기록하는 데이터에 맞게 자동 선택해도 된다. Mode selecting a real-time recording with a normal record is also set as a user manual, and is also automatically provide for data to the host device 2 is recording. 단계 S14에서는 1클러스터 단위로의 기록 처리를 행한다. In the step S14 performs a recording process of the 1 cluster unit. 즉, FAT를 참조하여 클러스터 단위로 빈 영역을 검색하여, 찾아낸 빈 영역에 순차적으로 데이터를 기록해 간다. That is, with reference to the FAT searching an empty area in cluster units, takes note of the data in order to find a blank area. 단계 S15에서는 FAT를 참조하여, 1블록분 연속한 빈 영역을 찾아내고, 1블록분 연속하여 빈 영역이 있으면, 그 블록에 대하여 연속하여 데이터를 기록한다. If this step S15 by referring to the FAT, to find a space area by one block in a row, one block of consecutive empty areas, and successively recording the data for that block. 즉, 빈 클러스터가 있었다고 해도, 그 빈 클러스터가 포함되어 있는 블록의 다른 클러스터에, 이미 데이터가 기록되어 있으면, 그 빈 클러스터에 대해서는 데이터를 기록하지 않는다. That is, even if there is an empty cluster, if the other cluster of the block that contains the empty cluster, data is already recorded, and does not record data for the free clusters. 예를 들면, 1블록이 4클러스터로 구성되어 있으면, 4클러스터 단위로 빈 블록에 대하여 데이터를 기록해 간다. For example, if the first block is composed of four clusters, it takes note of the data to the empty block to the 4 clusters. 호스트 기기(2)는, 통상이면 물리 포맷 상의 블록의 인식을 할 수 없지만, 본 메모리 카드(1)에서는 블록의 경계 위치가 반드시 클러스터의 경계 위치가 되도록 논리 포맷이 형성되어 있다. The host apparatus (2) is usually is not able to recognize the blocks on the physical format, the memory card 1 in a boundary position of the block is the logic format is formed to be a boundary position of the cluster. 그 때문에, 1블록 내의 클러스터 수(또는 섹터 수)와 블록의 경계의 클러스터 번호(또는 LBA 섹터 번호)를 알면, 논리 포맷 상에서 블록을 인식할 수 있다. For that reason, it is possible to know the number of clusters (or sector number) and the cluster number (or sector number LBA) of the boundary between blocks in the first block, recognizes the block on the logical format. 따라서, 호스트 기기(2)는 1블록 내의 클러스터 수 및 블록의 선두 클러스터의 위치를, 단계 S11에서 참조한 「1블록에 포함되는 섹터 수」 및 「블록 경계의 개시 섹터 번호」로부터 판단할 수 있다. Thus, the host apparatus 2 can determine from the "number of sectors included in the first block" or the "start of the block boundary sector number" referring to the location of the first cluster of the cluster number and the block in the first block, at step S11. 이러한 리얼타임 기록 모드를 적용하면, 클러스터의 사이즈보다 소거 블록의 사이즈쪽이 큰 미디어에 대해서도, 특수한 파일 시스템을 이용하지 않고, 블록 단위로 데이터를 기록할 수 있게 된다. Applying such a real-time recording mode, even for a large size media side of the erased blocks than the size of the cluster, without using a special file system, it is possible to record the data on a block-by-block basis. 이 때문에, 이 리얼타임 기록 모드에서는 기록된 데이터를 보호하기 위해서 필요한 불요 정보 정리(garbage collection)가 발생되지 않고, 데이터가 기록된다. Therefore, the real-time recording mode, the unnecessary information is not generated is clean (garbage collection) required to protect the recorded data, the data is recorded. 따라서, 통상 클러스터 단위로 기록을 하는 것보다 고속으로 기록할 수 있게 된다. Thus, it is possible to high-speed recording than in the normal recording cluster unit. 또, 통상의 파일 시스템에서는, 데이터의 기록 전 또는 기록 중에, 미디어 내의 빈 용량을 확인할 수 있다. Further, in the conventional file system, during the data write or before recording, it is possible to check the free space in the media. 호스트 기기(2)는 통상 기록 모드가 선택되고 있는 경우에는, FAT로부터 단순하게 빈 클러스터 수를 검출하여, 빈 용량을 산출한다. The host apparatus (2) in the case where the normal recording mode is selected, to simply detect a bin number of clusters from the FAT, and calculates the empty capacity. 한편, 리얼타임 기록 모드가 선택되어 있는 경우에는, FAT로부터 모든 클러스터가 미 기록인 블록을 검출하여, 그 블록 수로부터 빈 용량을 산출한다. On the other hand, if the real-time recording mode is selected, and all the cluster detects a non-written blocks from the FAT, and calculates the idle capacity from the number of blocks. 다음으로, 메모리 카드(1)의 구체적인 포맷예를 나타낸다. Next, the example shows a specific format of the memory card (1). 이하에 설명하는 포맷예는 전체 내용량이 64M바이트, 섹터 사이즈가 512바이트, 클러스터 사이즈가 32K바이트, 1블록의 사이즈가 128K바이트, 1개의 FAT를 기록하기 위해서 필요한 섹터 수가 8개인 메모리 카드(1)에 대한 것이다. Format for example, described below is the total amount of contents is 64M bytes, a sector size of 512 bytes, the cluster size is 32K bytes, the size of one block 128K bytes, a sector number of 8 individual memory card (1) necessary for recording one FAT to be about. 따라서, 1클러스터가 64섹터로 구성되고, 1블록이 4클러스터로 구성되어 있다. Therefore, the 1 cluster is configured by 64 sectors, are organized in a four cluster one block. 또, 본 예에서는 MS-DOS의 타입으로서, 총 클러스터 수가 4085를 초과하는 경우에 이용되는 FAT16을 적용한 경우에 대해서 설명한다. In the present example it will be described for the case where a type of the MS-DOS, applying the FAT16 used in the case that the total number of clusters exceeds 4085. FAT16에서는 FAT 내의 각 클러스터에 할당되는 바이트 수가 2바이트(16비트)이다. In FAT16 the number of bytes allocated to each cluster in the FAT is two bytes (16 bits). 도 8에 제1 구체예의 미디어 이미지를 도시한다. It shows a first embodiment the media image in Fig. 도 9에 제1 구체예의 각 파라미터의 값을 도시한다. It shows a first embodiment the value of each parameter in FIG. 도 10에 제1 구체예의 MBR의 기술 내용을 도시한다. Illustrate the technical details of the first embodiment MBR in Fig. 도 11에 제1 구체예의 PBR의 기술 내용을 도시한다. It shows a first embodiment of the PBR description in Fig. LBA 섹터 번호는 파티션이나 부팅 영역에 상관없이 미디어 내의 전체 유효 블록에 대하여 고유하게 붙여진 번호이다. LBA sector number is a unique number attached with respect to the entirety of the effective blocks in the media, regardless of the boot partition or region. LBA 섹터 번호는 선두 섹터가 0으로 되고, 이후 1씩 인크리먼트되어 있다. LBA sector number may begin sector is zero, it is later by one increment. 블록 번호는 각 유효 블록에 붙여진 논리 블록 번호이다. The block number is the logical block number given to each valid block. 블록 번호는 선두 블록이 0이 되고, 이후 1씩 인크리먼트되어 있다. The block number is 0, this first block, the later by one increment. 또, 유효 블록이 대체된 경우에는 대체된 블록에 대하여 LBA 섹터 번호 및 블록 번호가 붙여진다. Also, if the valid block is replaced is attached has the LBA sector number and the block number with respect to the replacement block. 제1 구체예에서는, MBR은 블록 번호 0의 선두 섹터(LBA 섹터 번호 0)에 기록된다. In the first embodiment, MBR is recorded at the head sector (LBA sector number 0) of the block number 0. PBR은 블록 번호 1의 LBA 섹터 번호 462의 섹터에 기록된다. PBR is recorded in sectors of a block number 1 of the LBA sector number 462. FAT1 및 FAT2는 블록 번호 1의 LBA 섹터 번호 464∼479의 섹터에 기록된다. FAT1 and FAT2 is written into the sector of the block number 1 in the sector number LBA 464-479. 루트 디렉토리 엔트리는 블록 번호 1의 LBA 섹터 번호 480∼511의 섹터에 기록된다. The root directory entry are recorded in the sector of the block number 1 in the sector number LBA 480-511. 이상과 같이 MBR, PBR, FAT, 루트 디렉토리 엔트리가 기록됨으로써, 사용자에 의해 생성된 파일이 기록되는 선두의 섹터(클러스터 2의 선두 섹터)는 블록 2의 선두 섹터(LBA 섹터 번호 512)로부터 기록되게 된다. By the MBR, PBR, FAT, the root directory entry is written as described above, the sector of the head to which a file is recorded is generated by the user (head sector of the cluster 2) is to be recorded from the head sector of the block 2 (LBA sector number 512) do. 그 결과, 블록의 경계 위치가 클러스터의 경계 위치에 일치한 논리 포맷이 되게 된다. As a result, the boundary position of this block to be a logical format matching the boundary positions in the cluster. 다음으로, 메모리 카드(1)의 구체적인 포맷의 제2 구체예를 설명한다. Next, a second embodiment of the specific format of the memory card (1). 도 12에 제2 구체예의 미디어 이미지를 도시한다. It shows a second embodiment an image on the media 12. 도 13에 제2 구체예의 각 파라미터의 값을 도시한다. It shows a second embodiment the value of each parameter in FIG. 도 14에 제2 구체예의 MBR의 기술 내용을 도시하고, 도 15에 제2 구체예의 PBR의 기술 내용을 도시한다. 2 shows a first embodiment of the MBR description in Figure 14, and illustrates a second embodiment of the PBR description in Fig. LBA 섹터 번호는 파티션이나 부팅 영역에 상관없이 미디어 내의 전체 유효 블록에 대하여 고유하게 붙여진 번호이다. LBA sector number is a unique number attached with respect to the entirety of the effective blocks in the media, regardless of the boot partition or region. LBA 섹터 번호는 선두 섹터가 0이 되고, 이후 1씩 인크리먼트되어 있다. LBA sector number is the head sector is zero, is incremented by 1 after. 블록 번호는 각 유효 블록에 붙여진 논리 블록 번호이다. The block number is the logical block number given to each valid block. 블록 번호는 선두 블록이 0이 되고, 이후 1씩 인크리먼트되어 있다. The block number is 0, this first block, the later by one increment. 또, 유효 블록이 대체된 경우에는, 대체된 블록에 대하여 LBA 섹터 번호 및 블록 번호가 붙여진다. Further, when the valid block is replaced, the LBA is attached the sector number and the block number with respect to the replacement block. 제2 구체예에서는, MBR은 블록 번호 0의 선두 섹터(LBA 섹터 번호 0)에 기록된다. In the second embodiment, MBR is recorded at the head sector (LBA sector number 0) of the block number 0. PBR은 블록 번호 1의 LBA 섹터 번호 335의 섹터에 기록된다. PBR is recorded in sectors of a block number 1 of the LBA sector number 335. FAT1 및 FAT2는 블록 번호 1의 LBA 섹터 번호 336∼351의 섹터에 기록된다. FAT1 and FAT2 is written into the sector of the block number 1 in the sector number LBA 336-351. 루트 디렉토리 엔트리는 블록 번호 1의 LBA 섹터 번호 352∼383의 섹터에 기록된다. The root directory entry are recorded in the sector of the block number 1 in the sector number LBA 352-383. 이상과 같이 MBR, PBR, FAT, 루트 디렉토리 엔트리가 기록됨으로써, 사용자에 의해 생성된 파일이 기록되는 선두의 섹터(클러스터 2의 선두 섹터)는 블록 1의 LBA 섹터 번호 384부터 기록되게 된다. By the MBR, PBR, FAT, the root directory entry is written as described above, the leading sector of the file is recorded is generated by the user (head sector of the cluster 2) is recorded from the sector number 384 of LBA block 1. 그 결과, 블록의 경계 위치가 클러스터의 경계 위치에 일치한 논리 포맷이 되게 된다. As a result, the boundary position of this block to be a logical format matching the boundary positions in the cluster. 이상과 같이 제1 구체예와 제2 구체예는, 블록 경계 위치가 클러스터 경계 위치가 되어 있으며, 모두 호스트 기기(2)측으로부터, 블록 단위의 일괄 기록을 할 수 있는, 즉 4클러스터 단위로 기록을 할 수 있다. The first embodiment and the second embodiment as described above, the block boundary position, and the cluster boundary position, which both can execute a batch writing of the block unit from the host apparatus 2 side, that is recorded in the four clusters can do. 그런데, FAT16의 포맷에서는 선두의 8바이트가 "F8FF FFFF"의 규정값으로 되어 있다. By the way, it is in the FAT16 format of the first 8 bytes are defined by the value of "F8FF FFFF". 또한, FAT16의 포맷에서는 9바이트째부터 4바이트씩 각 클러스터의 영역이 정해져 있다. Further, in the FAT16 format from the ninth byte by 4-byte area it is determined for each cluster. 최초의 클러스터의 클러스터 번호는 "2"이다. Cluster Number of the first cluster is "2". 또, 본 예에서는 1섹터당 바이트 수가 512바이트이다. Further, in this embodiment, is one byte per 512-byte sector number. 따라서, FAT의 제1 섹터에는 클러스터 번호 2∼클러스터 번호 127까지의 클러스터의 영역이 형성되게 된다. Accordingly, the first sector of the FAT, the area of ​​the cluster to the cluster numbers 2 to cluster number 127 is to be formed. 제1 구체예의 포맷인 경우, 도 16에 도시한 바와 같이 클러스터 번호 02, 03, 04, 05로 블록 2가 구성되고, 클러스터 번호 06, 07, 08, 09로 블록 3이 구성되고, 클러스터 번호 0a, 0b, 0c, 0d로 블록 4가 구성되어, 이후 4클러스터마다 1개의 블록이 구성된다. The first embodiment, if the format of this are in cluster number 02, as shown in 16, 03, 04, and the block 2 consists of 05, the cluster numbers 06, 07, 08, the block 3 to 09 is composed, the cluster number 0a , is a block composed of 4 0b, 0c, 0d, since 4 is a block diagram for each one cluster. 또한, 제1 구체예의 포맷인 경우, FAT의 선두 섹터는 블록 33의 2번째 클러스터(클러스터 7f)에서 종료되고 있다. In the case where the first embodiment format, the leading sector of the FAT has been terminated at the second cluster of the block 33 (cluster 7f). 그리고, FAT의 2번째 섹터는 블록 33의 3번째 클러스터(클러스터 80)로부터 개시되어 있다. Then, the second sector of the FAT is described from the third block of the second cluster 33 (cluster 80). 즉, 제1 구체예의 포맷에서는, FAT 내에서 표시되어 있는 블록의 경계 위치와, FAT의 실제의 섹터 위치가 일치하지 않는다. That is, the first embodiment in the format, the boundary position and the actual position of the sector of the FAT of the block which is displayed in the FAT does not match. 이에 대하여, 제2 구체예의 포맷인 경우, 도 17에 도시한 바와 같이 클러스터 번호 02, 03으로 블록 1이 구성되고, 클러스터 번호 04, 05, 06, 07로 블록 2가 구성되고, 클러스터 번호 08, 09, 0a, 0b로 블록 3이 구성되고, 클러스터 번호 0c, 0d, 0e, 0f로 블록 4가 구성되어, 이후 4클러스터마다 1개의 블록이 구성된다. On the other hand, the second embodiment, if the format of FIG. 17 which is the block 1 consists of a cluster numbers 02, 03, as shown in cluster numbers 04, 05, 06, and the block 2 consists of 07, the cluster number 08, 09, 0a, 0b, and a block composed of 3, 4 is a block composed of a cluster number 0c, 0d, 0e, 0f, since 4 is a block diagram for each one cluster. 또한, 제2 구체예의 포맷인 경우, FAT의 선두 섹터는 블록 32의 4번째 클러스터, 즉 블록 내의 마지막의 클러스터(클러스터 7f)에서 종료되고 있다. In the case where the second embodiment format, the leading sector of the FAT has been terminated at the last cluster (cluster 7f) in the fourth cluster, that is, blocks of the block 32. 그리고, FAT의 2번째 섹터는 블록 33의 최초의 클러스터로부터 개시되어 있다. Then, the second sector of the FAT is described from the first cluster of the block 33. 즉, 제2 구체예의 포맷에서는, FAT 내에서 표시되어 있는 블록의 경계 위치와, FAT의 실제의 섹터 위치가 일치하고 있다. That is, the second embodiment in the format, the boundary position and the actual position of the sector of the FAT of the block which is displayed in the FAT coincides. FAT의 실제의 섹터 경계와, FAT로 표시된 블록의 경계가 일치하지 않는 경 우, 예를 들면 섹터 경계에 있는 블록의 클러스터 정보를 판독하는 경우, 2개의 섹터를 판독해야 한다. Case, the block boundary indicated by the physical sector of the border and, in the FAT FAT do not match, for example, in the case of reading the cluster information of the blocks in the sector boundary, it should readout the two sectors. 그에 대하여, FAT의 실제의 섹터 경계와, FAT로 표시된 블록의 경계가 일치하고 있는 경우, 섹터 경계에 있는 블록의 클러스터 정보를 판독한 경우에도, 1개의 섹터만을 판독하면 된다. Respect thereto, in the case where the boundary of the block indicated by the physical sector of the border and, in the FAT FAT match, even if reading the cluster information of the blocks in the sector boundary, and if the read only one sector. 따라서, 제1 구체예의 포맷보다 제2 구체예의 포맷이, 호스트 기기(2)측에서의 파일 관리가 용이하게 된다. Therefore, in the second embodiment than the first format, the format of these embodiments, it becomes the host apparatus 2 side is the file management easy. 제1 구체예와 제2 구체예는 양자 모두, MBR이 단독의 블록에 기록되어 있다. The first embodiment and the second embodiment are both are both, the MBR is written to the block of the sole. 즉, MBR이 PBR, FAT, 루트 디렉토리 엔트리와는 다른 블록에 기록되어 있다. I.e., it is written to another block and the MBR PBR, FAT, root directory entry. 이와 같이 MBR을 단독의 블록에 기록함으로써, 플래시 메모리와 같은 일괄 소거 단위가 정해진 미디어인 경우, 파일의 안전성이 확보된다. With such a record in the MBR of the block alone, in the case where the batch erase unit such as a flash memory, fixed media, is ensured the safety of the file. 즉, 재기입의 가능성이 있는 PBR, FAT, 루트 디렉토리 엔트리나, 실제 데이터와는 다른 블록에 기록되어 있기 때문에, MBR을 재기입할 필요가 없게 되어, 파일의 안전성이 확보된다. That is, because it is written to the PBR, FAT, root directory entry or, actually, other block data and possibly re-written, it is not necessary to re-write the MBR, it is assured the safety of the file. 이러한 MBR과, PBR, FAT, 루트 디렉토리를 다른 블록에 기록하는 것은, 본 메모리 카드(1)와 같은 블록 사이즈가 클러스터 사이즈보다 큰 경우가 아니더라도 적용할 수 있다. The recording such as MBR, PBR, FAT, root directory, to another block, the block size, such as the memory card 1 may be applied, if not greater than the cluster size. 통상, 도 18에 도시한 바와 같이 MBR, PBR, FAT, 루트 디렉토리 엔트리는 블록 위치에 상관없이 섹터 단위로 연속하여 기록된다. Typically, the MBR, PBR, FAT, root directory entry as shown in FIG. 18 is recorded continuously on a sector-by-sector basis, regardless of the block position. 즉, MBR이 섹터 0, PBR이 섹터 1의 섹터에 기록된다. That is, the MBR sector 0, the PBR is recorded in the sector of the sector 1. 그에 대하여, 클러스터 사이즈가 32K바이트, 블록 사이즈가 16K바이트 등의, 블록 사이즈가 클러스터 사이즈보다 작은 메모리 카드인 경우에는, 도 19에 도시한 바와 같이 MBR을 섹터 번호 0의 섹터에 기록하고, PBR을 섹터 번호 47의 섹터에 기록하면 된다. It against, the cluster size, such as 32K bytes, the block size is 16K bytes, when the block size of a small memory card than cluster size, the PBR record the MBR to a sector of a sector number 0, and as shown in Fig. 19 is written in the sector if the sector number 47. 또한, 클러스터 사이즈가 32K바이트, 블록 사이즈가 32K바이트 등의, 블록 사이즈와 클러스트 사이즈가 일치하는 메모리 카드인 경우에는, 도 20에 도시한 바와 같이 MBR을 섹터 번호 0의 섹터에 기록하고, PBR을 섹터 번호 79의 섹터에 기록하면 된다. In addition, the cluster size, such as 32K bytes, the block size is 32K bytes, the block size and in the case of a memory card to the cluster size matched, the PBR record the MBR to a sector of a sector number 0, and as shown in Fig. 20 is written in the sector if the sector number 79. 또, 본 발명은 도면을 참조하여 설명한 상술한 예에 한정되는 것이 아니고, 첨부의 청구의 범위 및 그 주지를 일탈하지 않고, 여러가지 변경, 치환, 또는 그 동등한 것을 행할 수 있는 것은 당업자에게 있어서 분명하다. In addition, the present invention is not limited to the above example described with reference to the accompanying drawings, it is that without departing from the claims and not in the attachment, can be performed to various changes, substitutions, or equivalent it is clear to those skilled in the art . 본 발명에 따른 데이터 기억 장치에서는, 호스트 기기로부터 초기화 커맨드가 주어지면, 내부에 저장되어 있는 파라미터에 따라, 논리 포맷용의 파일 관리 데이터를 반도체 메모리에 기록하도록 하고 있기 때문에, 호스트 기기가 초기화용의 제어 프로그램이나 파라미터를 구비하지 않고 용이하게 초기화를 행할 수 있다. In the data storage apparatus according to the present invention, the file management data for the logical format, in accordance with the parameter stored in the internal Given the initialization command, from the host apparatus so that is recorded on a semiconductor memory, for a host device, the initialization It can be performed easily without initializing a control program and parameters. 상기 제어부는 상기 호스트 기기로부터 초기화 커맨드가 주어지면, 상기 시스템 정보 기억부에 저장되어 있는 파라미터에 따른 파일 관리 데이터를 상기 반도체 메모리에 기록하는 리무버블 데이터 기억 장치. Wherein the control unit a removable data storage device that given the initialization command from the host device, it records the file management data corresponding to the parameter stored in the system information storage unit to the semiconductor memory. 상기 제어부는, 상기 호스트 기기로부터 파라미터 판독 커맨드가 주어지면, 상기 시스템 정보 기억부에 저장되어 있는 파라미터를 상기 인터페이스를 통하여 호스트 기기에 송신하는 리무버블 데이터 기억 장치. A removable data storage device to transmit the control unit, given the parameter read command from the host device, the host device via the interface, the parameter stored in the system information storage section. 상기 시스템 정보 기억부는, 상기 반도체 메모리 상에 형성되어 있는 리무버블 데이터 기억 장치. The system information storage unit, the removable data storage device that is formed on the semiconductor memory. 상기 파일 관리 데이터는, 데이터의 기입 및 판독 단위인 섹터마다 논리 어드레스를 설정하여 기록 데이터를 관리함과 함께, 상기 클러스터가 소정의 수의 섹터로 구성되어 있는 논리 포맷에 대응하고 있는 리무버블 데이터 기억 장치. The file management data is a removable data storage device, and to set the logical address for each sector of the write and read unit of data corresponding to the logical formats in conjunction with managing the record data, the cluster is composed of a predetermined number of sectors . 상기 논리 포맷은, 상기 사용자 영역 내의 각 블록의 선두의 섹터를, 상기 클러스터의 선두의 섹터와 일치시키고 있는 리무버블 데이터 기억 장치. The logical format is a removable data storage device in the head of the sector of each block, and consistent with the cluster of the head sector in the user area. 각 파티션에 기록되는 실체 데이터는 상기 루트 디렉토리 엔트리의 다음의 섹터로부터 기록되는 리무버블 데이터 기억 장치. Entity the data to be written to the each partition is a removable data storage apparatus to be recorded from the next sector of the root directory entry. 상기 논리 포맷은, 1개의 블록에 기록되는 연속한 n개의 클러스터에 대한 연결 정보의 기록 영역이 1개의 섹터 내에 완결하여 형성되도록 설정되는 리무버블 데이터 기억 장치. The logical format is a removable data storage device is set so that the recording area of ​​the connection information for the n consecutive clusters to be recorded in one block formed by completing in one sector. 상기 호스트측 인터페이스는, 통상 시에는 상기 논리 포맷에 기초하여 상기 데이터 기억 장치에 액세스를 행하고, 초기화 시에는 초기화 커맨드를 상기 데이터 기억 장치에 제공하는 호스트 기기. The host-side interface, the normal time, the host apparatus for providing the data access is performed in the storage device, an initialization at the time of initialization commands on the basis of the logical format in the data storage device. 상기 데이터 기억 장치의 제어부는, 상기 호스트 기기로부터 파라미터 판독 커맨드가 주어지면, 상기 시스템 정보 기억부에 저장되어 있는 파라미터를 상기 인터페이스를 통하여 호스트 기기에 송신하는 호스트 기기. The data controller of the memory device, when the parameters read command is given from the host device, the host device transmitting to the host apparatus through the interface, the parameter stored in the system information storage section. 상기 데이터 기억 장치의 시스템 정보 기억부는, 상기 반도체 메모리 상에 형성되어 있는 호스트 기기. System information storage unit, the host apparatus that is formed on the semiconductor memory within the data store. 상기 파일 관리 데이터는, 데이터의 기입 및 판독 단위인 섹터마다 논리 어드레스를 설정하여 기록 데이터를 관리함과 함께, 상기 클러스터가 소정의 수의 섹터로 구성되어 있는 논리 포맷에 대응하고 있는 호스트 기기. The file management data, the host in conjunction with managing the record data by setting the logical address for each sector of the write and read unit of data, and the cluster corresponding to the logical format that consists of a predetermined number of sectors of the device. 상기 논리 포맷은, 상기 사용자 영역 내의 각 블록의 선두의 섹터를, 상기 클러스터의 선두의 섹터와 일치시키고 있는 호스트 기기. The logical format, the start of the sector of each block, the host device that was consistent with a head sector of the cluster in the user area. 각 파티션에 기록되는 실체 데이터는 상기 루트 디렉토리 엔트리의 다음의 섹터로부터 기록되는 호스트 기기. Entity the data to be written to the each partition is a host apparatus to be recorded from the next sector of the root directory entry. 상기 논리 포맷은, 1개의 블록에 기록되는 연속한 n개의 클러스터에 대한 연결 정보의 기록 영역이 1개의 섹터 내에 완결하여 형성되도록 설정되어 있는 호스트 기기. The logical format, the host device that has an information recording area of ​​the connection for the n consecutive clusters to be recorded in one block is set to form the completed within one sector. 상기 제어부는 상기 호스트 기기로부터 초기화 커맨드가 주어지면, 상기 시스템 정보 기억부에 저장되어 있는 파라미터에 따른 파일 관리 데이터를 상기 반도체 메모리에 기록하는 데이터 기록 시스템. The control data is written to the system given the initialization command from the host device, it records the file management data corresponding to the parameter stored in the system information storage unit to the semiconductor memory. 상기 제어부는, 상기 호스트 기기로부터 파라미터 판독 커맨드가 주어지면, 상기 시스템 정보 기억부에 저장되어 있는 파라미터를 상기 인터페이스를 통하여 호스트 기기에 송신하는 데이터 기록 시스템. Wherein the controller, when the parameters read command is given from the host apparatus, a data recording system for transmitting to the host apparatus through the interface, the parameter stored in the system information storage section. 상기 시스템 정보 기억부는, 상기 반도체 메모리 상에 형성되어 있는 데이터 기록 시스템. The system information storage unit, the data recording system that is formed on the semiconductor memory. 상기 파일 관리 데이터는, 데이터의 기입 및 판독 단위인 섹터마다 논리 어드레스를 설정하여 기록 데이터를 관리함과 함께, 상기 클러스터가 소정의 수의 섹터로 구성되어 있는 논리 포맷에 대응하고 있는 데이터 기록 시스템. The file management data, along with managing the record data by setting the logical address for each sector of the write and read unit of data, the data recording system that is the cluster corresponding to the logical format that consists of a predetermined number of sectors. 상기 논리 포맷은, 상기 사용자 영역 내의 각 블록의 선두의 섹터를, 상기 클러스터의 선두의 섹터와 일치시키고 있는 데이터 기록 시스템. The logical format, the start of the sector of each block, the data recording system which coincides with the cluster of the head sector in the user area. 각 파티션에 기록되는 실체 데이터는 상기 루트 디렉토리 엔트리의 다음의 섹터로부터 기록되는 데이터 기록 시스템. Entity the data to be written to the each partition is a data recording system which records from the next sector of the root directory entry. 상기 논리 포맷은, 1개의 블록에 기록되는 연속한 n개의 클러스터에 대한 연결 정보의 기록 영역이 하나의 섹터 내에 완결하여 형성되도록 설정되어 있는 데이터 기록 시스템. The logical format is a data recording system in which the recording area of ​​the connection information for the n consecutive clusters to be recorded in one block is set to form the completed within one sector. 상기 호스트 기기로부터 초기화 커맨드가 주어지면, 상기 시스템 정보 기억부에 저장되어 있는 파라미터에 따른 파일 관리 데이터를 상기 반도체 메모리에 기록하는 리무버블 데이터 기억 장치의 데이터 관리 방법. Given the initialization command from the host device, a removable data management method of the data storage device for recording file management data corresponding to the parameter stored in the system information storage unit to the semiconductor memory. 상기 호스트 기기로부터 파라미터 판독 커맨드가 주어지면, 상기 시스템 정보 기억부에 저장되어 있는 파라미터를 상기 인터페이스를 통하여 호스트 기기에 송신하는 리무버블 데이터 기억 장치의 데이터 관리 방법. If the parameter read command is given from the host apparatus, a data management method for a removable data storage device to be transmitted to the host apparatus through the interface, the parameter stored in the system information storage section. 상기 시스템 정보 기억부는, 상기 반도체 메모리 상에 형성되어 있는 리무버블 데이터 기억 장치의 데이터 관리 방법. The system information storage unit, a data management method for a removable data storage device that is formed on the semiconductor memory. 상기 파일 관리 데이터는, 데이터의 기입 및 판독 단위인 섹터마다 논리 어드레스를 설정하여 기록 데이터를 관리함과 함께, 상기 클러스터가 소정의 수의 섹터로 구성되어 있는 논리 포맷에 대응하고 있는 리무버블 데이터 기억 장치의 데이터 관리 방법. The file management data is a removable data storage device, and to set the logical address for each sector of the write and read unit of data corresponding to the logical formats in conjunction with managing the record data, the cluster is composed of a predetermined number of sectors data management methods. 상기 논리 포맷은, 상기 사용자 영역 내의 각 블록의 선두의 섹터를, 상기 클러스터의 선두의 섹터와 일치시키고 있는 리무버블 데이터 기억 장치의 데이터 관리 방법. The logical format, the start of the sector of each block, the data managing method for a removable data storage device coincides with the cluster of the head sector in the user area. 각 파티션에 기록되는 실체 데이터는 상기 루트 디렉토리 엔트리의 다음의 섹터로부터 기록되는 리무버블 데이터 기억 장치의 데이터 관리 방법. Entity the data to be written to each partition a data management method for a removable data storage apparatus to be recorded from the next sector of the root directory entry. 상기 논리 포맷은, 1개의 블록에 기록되는 연속한 n개의 클러스터에 대한 연결 정보의 기록 영역이 1개의 섹터 내에 완결하여 형성되도록 설정되어 있는 리무버블 데이터 기억 장치의 데이터 관리 방법. The logical format is a continuous n data management method for a removable data storage devices with a recording area of ​​the connection information is set to form the completed within one sector of the clusters to be recorded in one block.